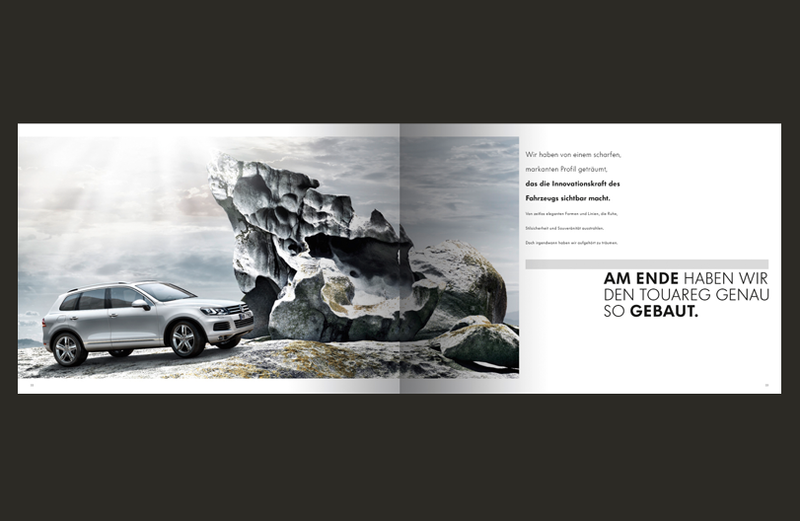 Leading Creative Director, specialized in branding and design. 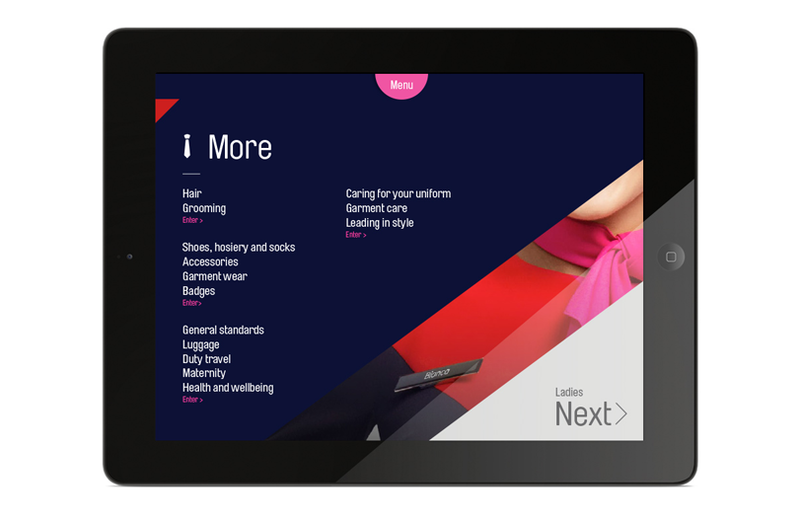 Helping brands master the challenges in a digital and social-media driven landscape – through design, technology and collaboration. 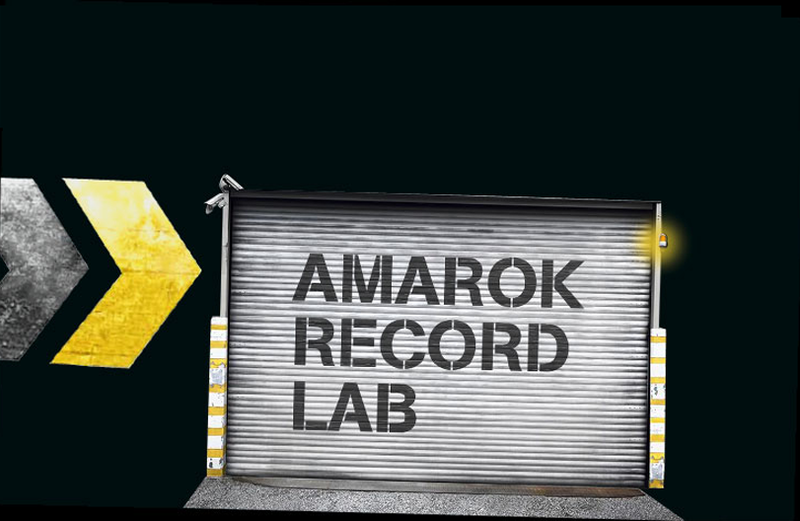 Enter "Track Me," a social musical experiment created for the Brooklyn-based alternative rock/hip hop crew, Riot !n Paris. 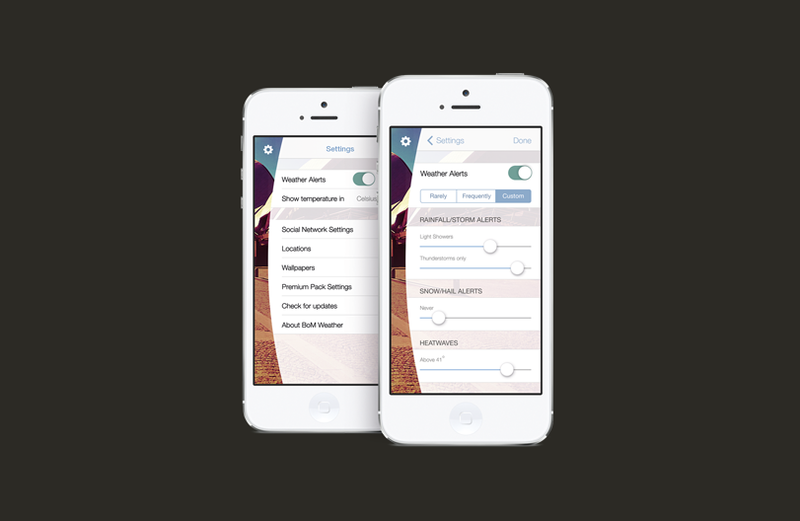 Over a whole month the band created studio-quality personalized songs based on strangers' social media profiles. 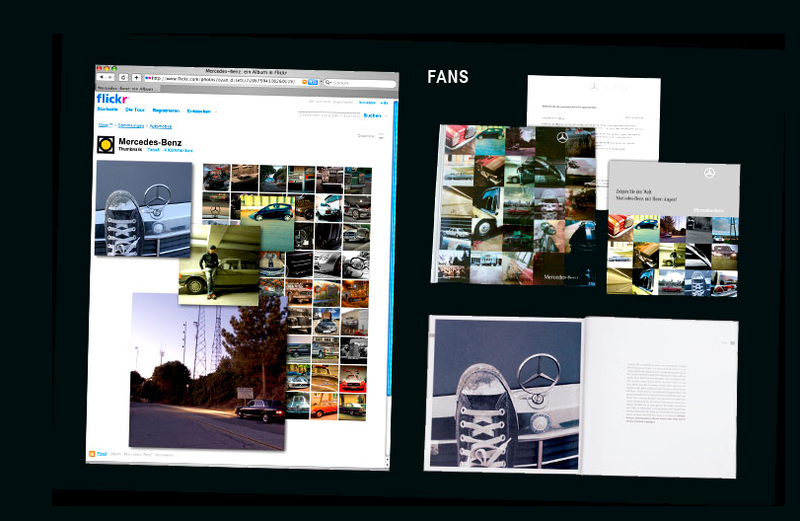 Winner of the 2012 MTV oMusic Awards in the category Most Extreme Fan Outreach. 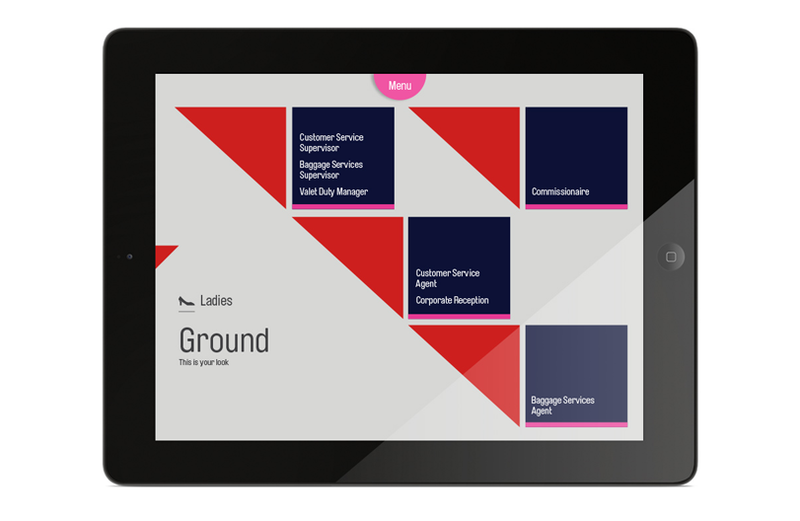 A virtual stadium experience available on your mobile. 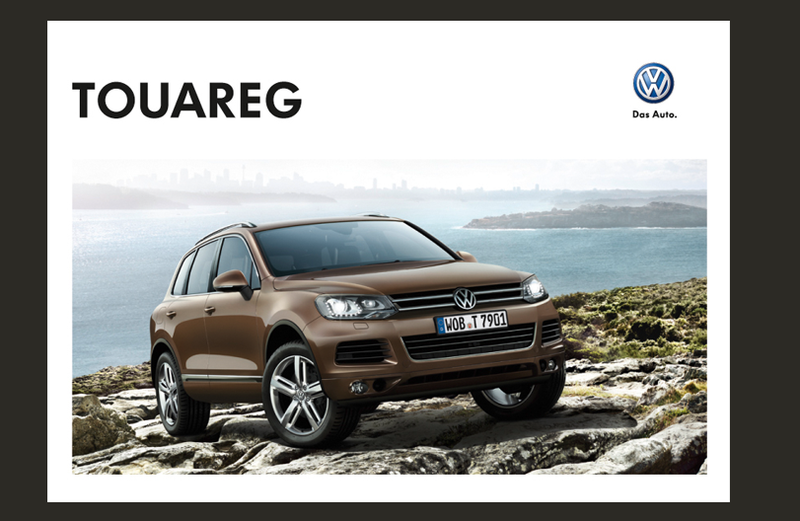 If a rugby fan couldn't make the game, we brought the game to them. 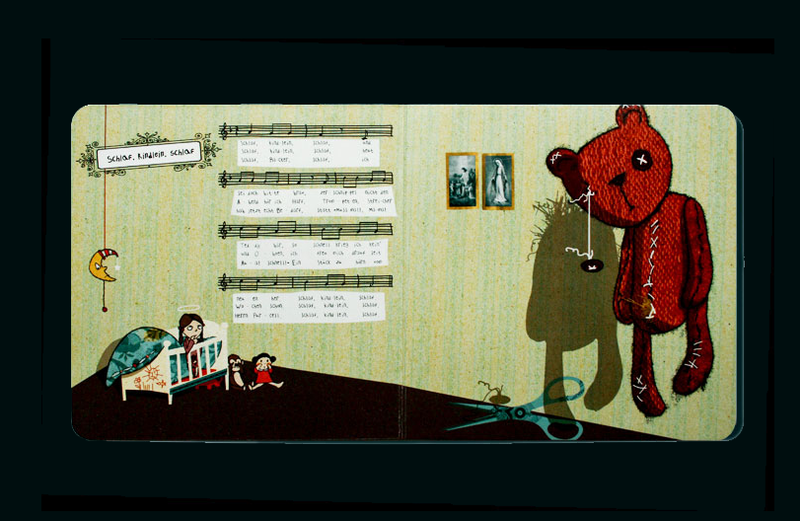 We invited fans to "say it with a love song" on Valentine's Day, by tweeting us their special message for a loved one. 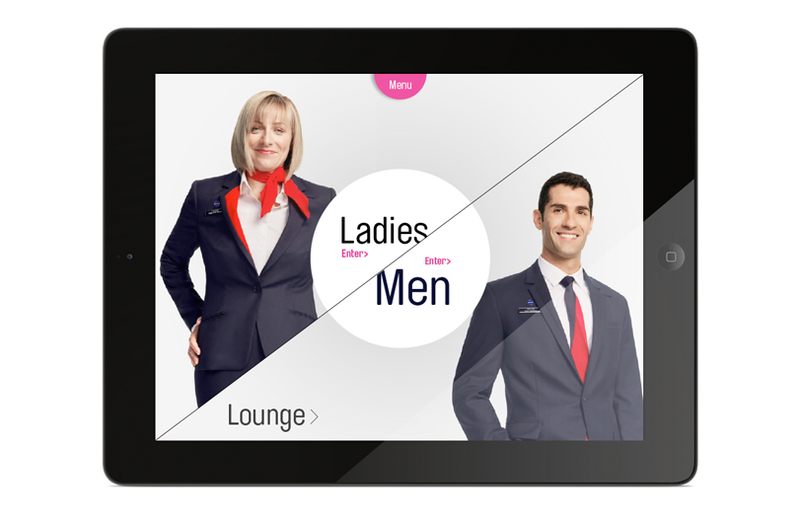 The best were passed onto our IGA songbirds and turned into personalised music videos and Vines in real-time. 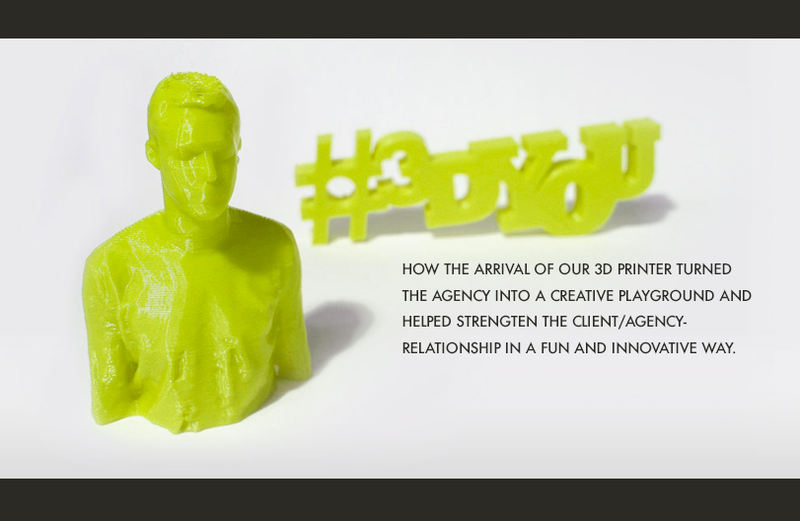 Twitter themselves announced IGA Love Songs as the best creative Valentine's Day campaign on Twitter in 2014. 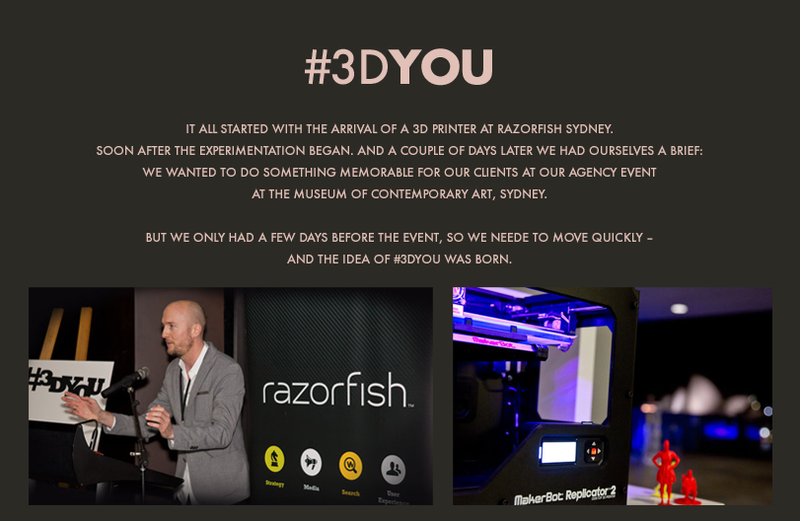 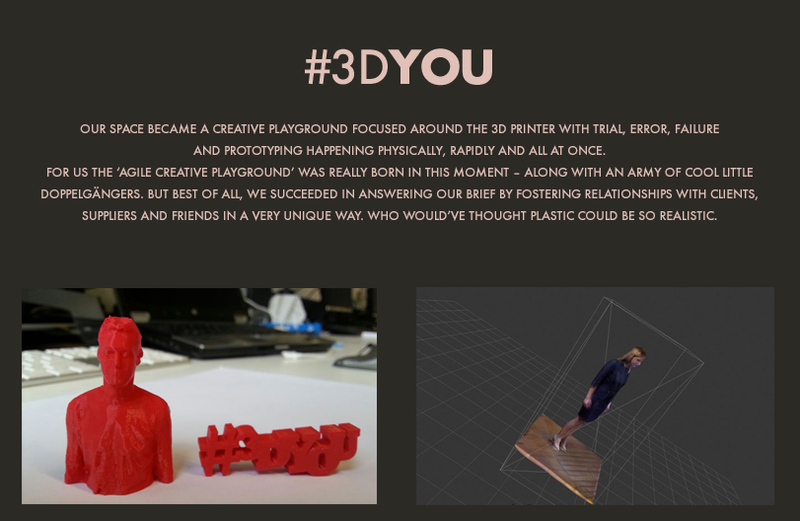 #3DYou gave Razorfish clients the exclusive chance to get their very own ’3DYOU’ figurine. 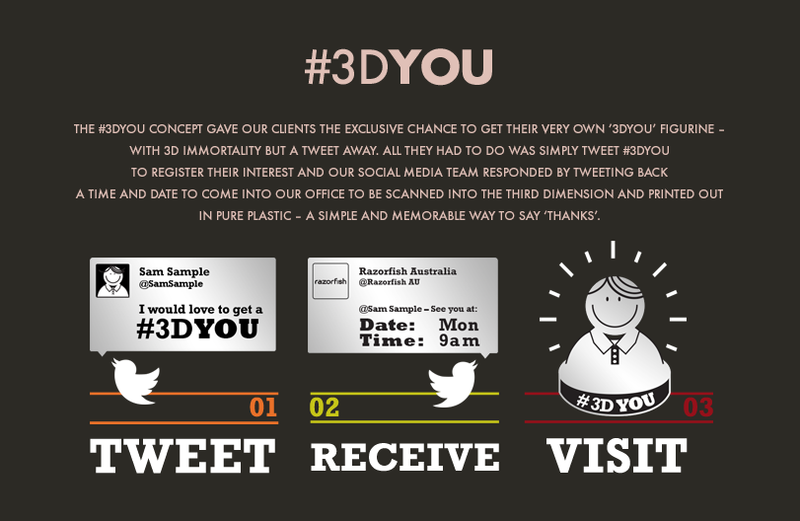 Simply tweet #3DYou to register interest and our social media team responded by tweeting back a time and date to come into our office to be scanned and printed out in pure plastic – a simple way to strengthening the client/agency relationship in a fun and innovative way. 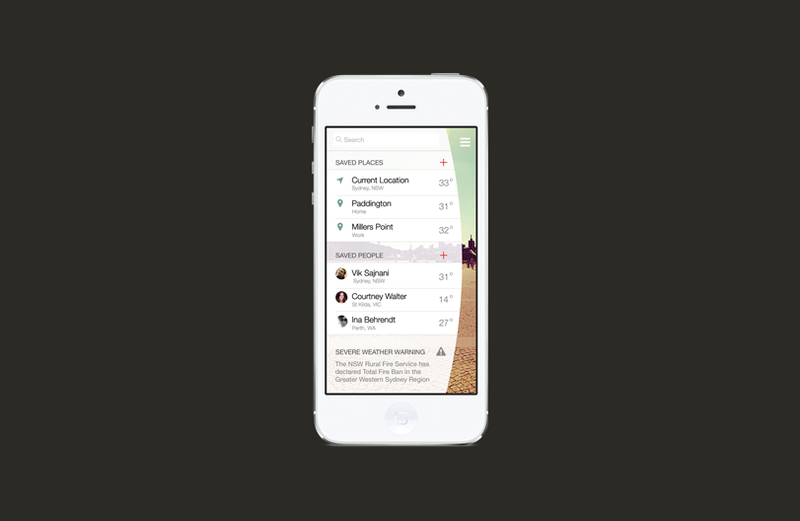 To promote the launch of the TV show ‘Duck Dynasty’, A&E created a Social Media Response Lab and gamified Twitter by launching ‘The Virtual Duck Call’ – the first ‘duck hunt’ game on Twitter. 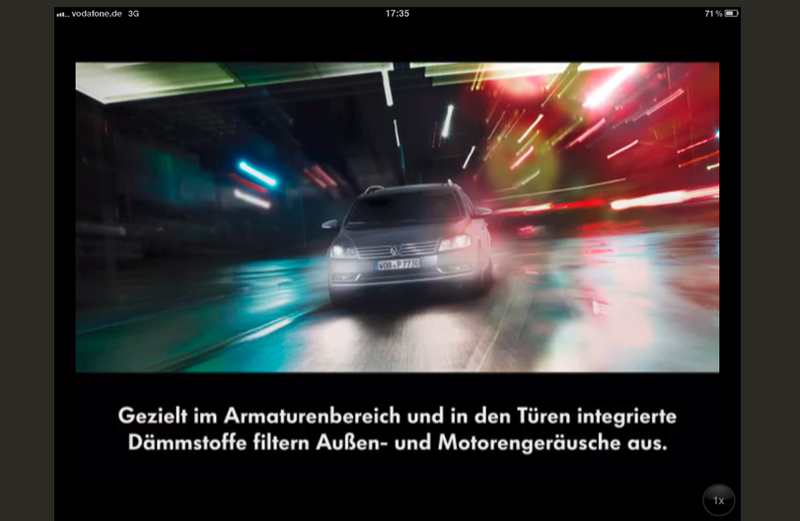 Results: Total of 8.6 million viewers for the premiere, making it A&E's most watched telecast of all time. 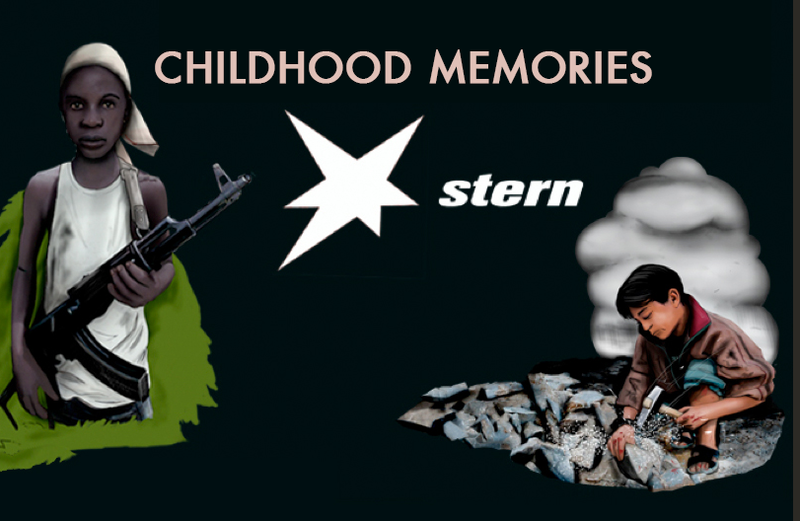 based on what you've liked in the past. 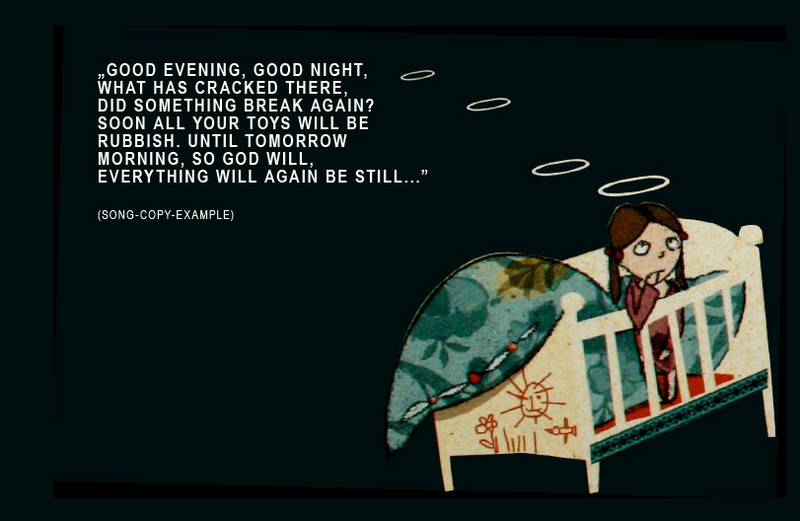 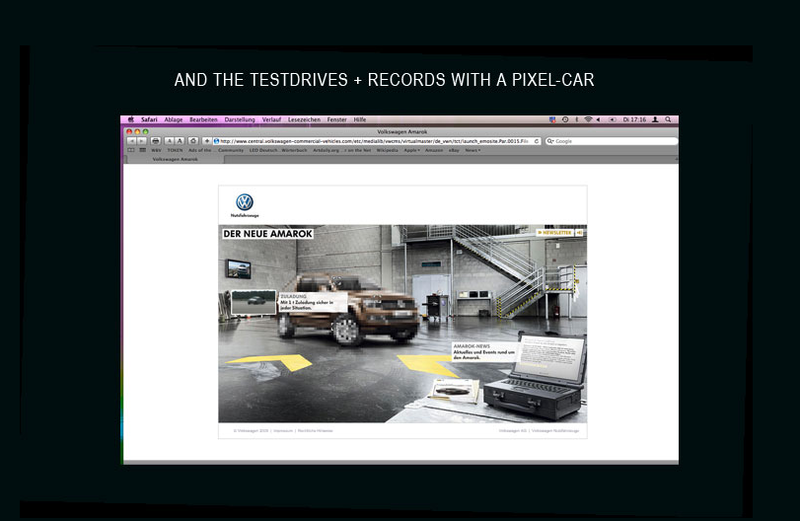 Winner of a Silver and Bronze Lion at the Cannes Lions Festival in 2013. 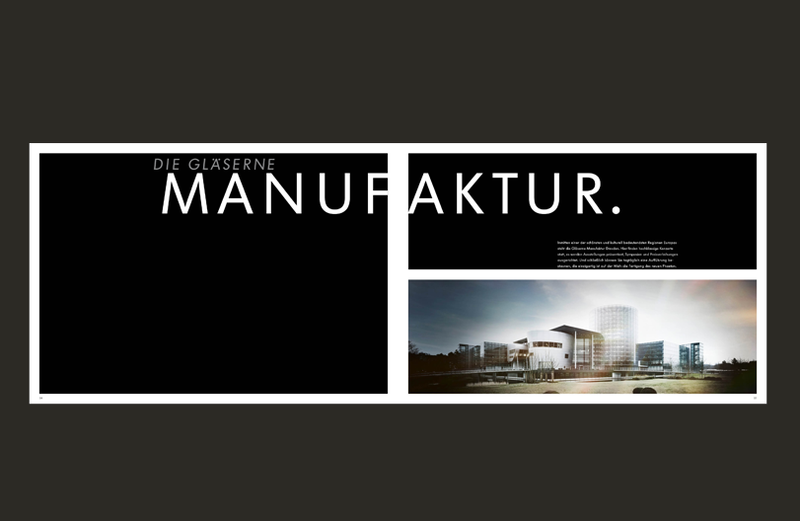 Ina was part of the team of “#GetTheMayor” – a worlds-first social media-led citizen engagement platform for the City of Heidelberg that lets all citizens get involved in helping shape the future of their city. The platform brings projects and issues that citizens are most passionate about in front of their Mayor – so that together we can create and collaborate for a better city. 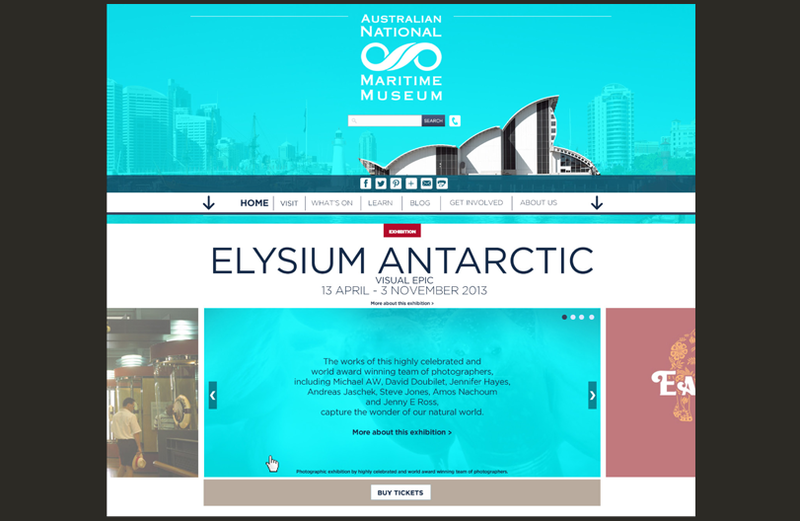 The MCA wanted to give Craig Walsh’s new exhibition Embedded a digital voice to extend the exhibition experience online and create an engaging platform. 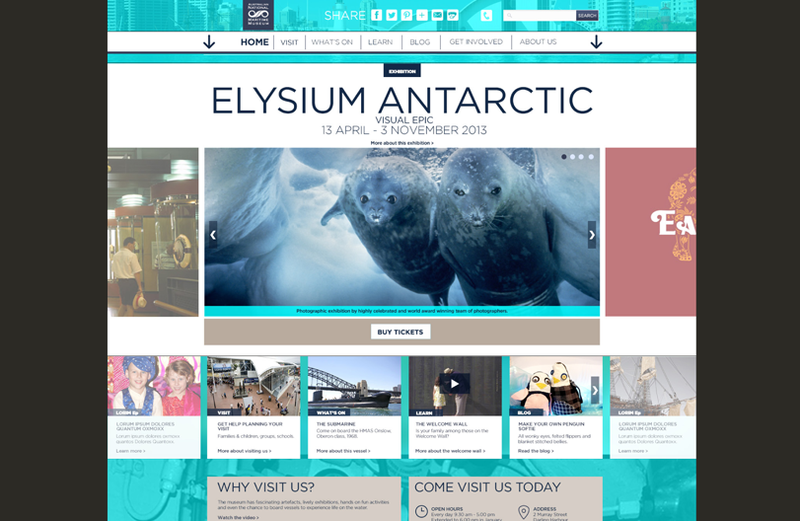 By keeping the website as simple as possible a ‘back to the roots style approach’ and incorporating geographic navigation inspired by the sense of land and place, we were able to share the interactive stories behind the exhibition. 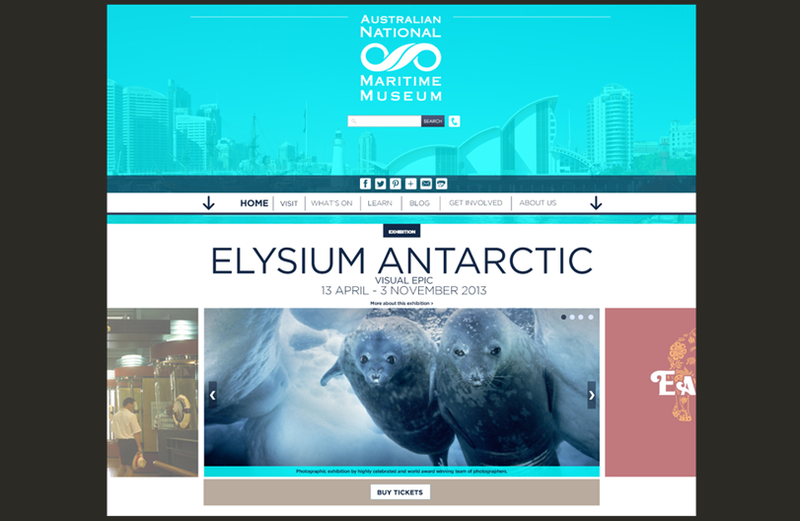 The vision was to explore and manage maritime heritage in ways that enlighten, inspire and delight people everywhere. 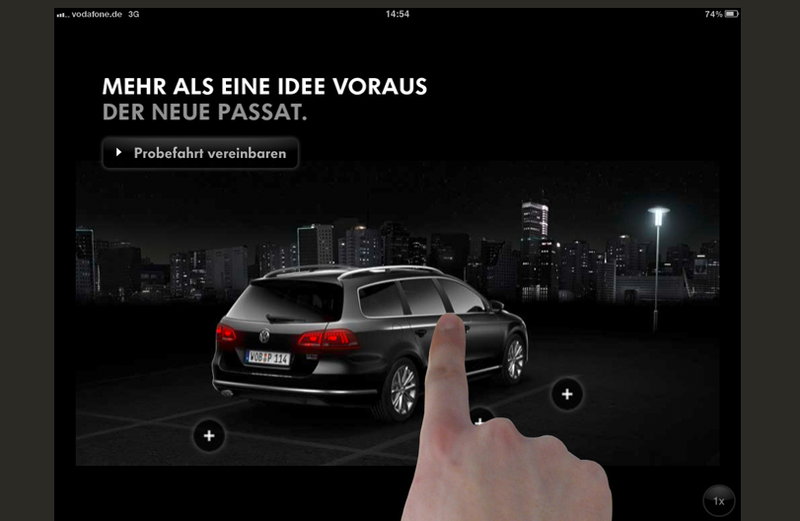 encourage the user activity on social, too? 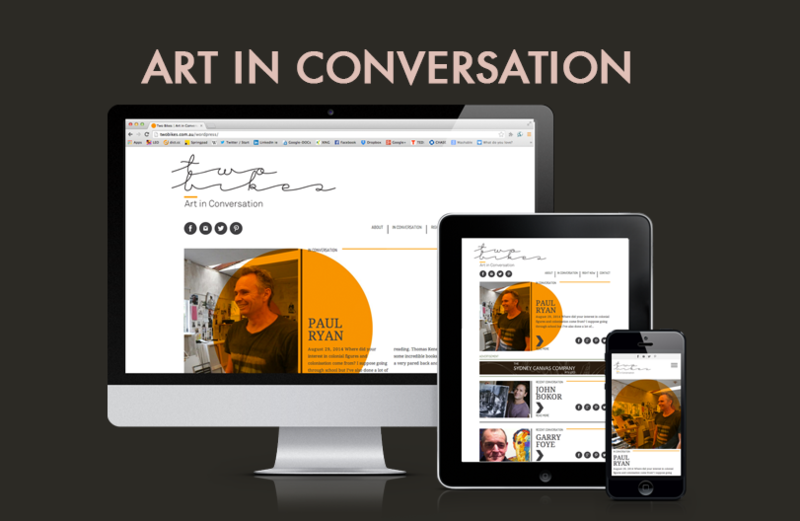 Ina worked together with these two art passionists, enthusiasts, art lover and collector and created the responsive design for their new platform – ART IN CONVERSATION – Australias first website that celebrates Australian artists at various stages of their careers. 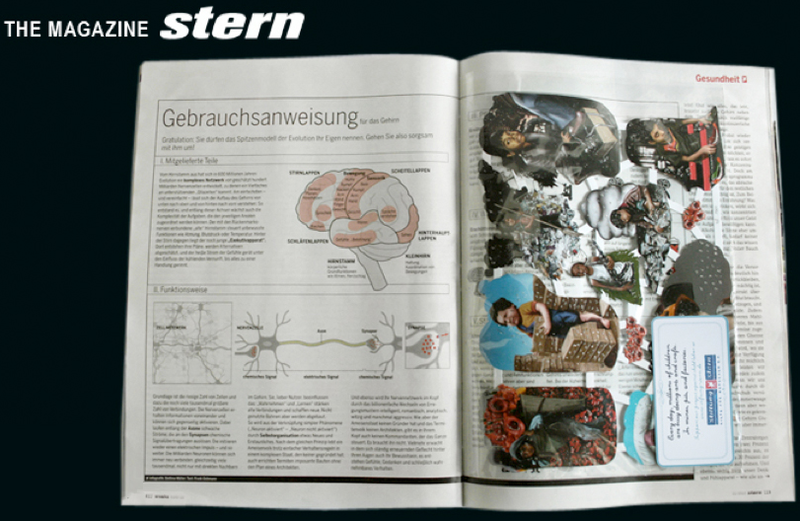 Two bikes visit artists at their homes or studios and share their insights, influences and the pure reality of their everyday lives. 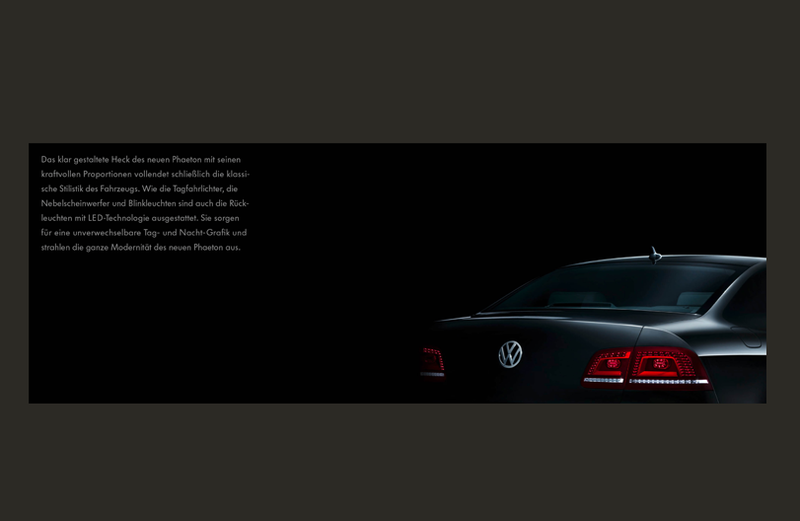 It’s really about the artist in the spotlight! 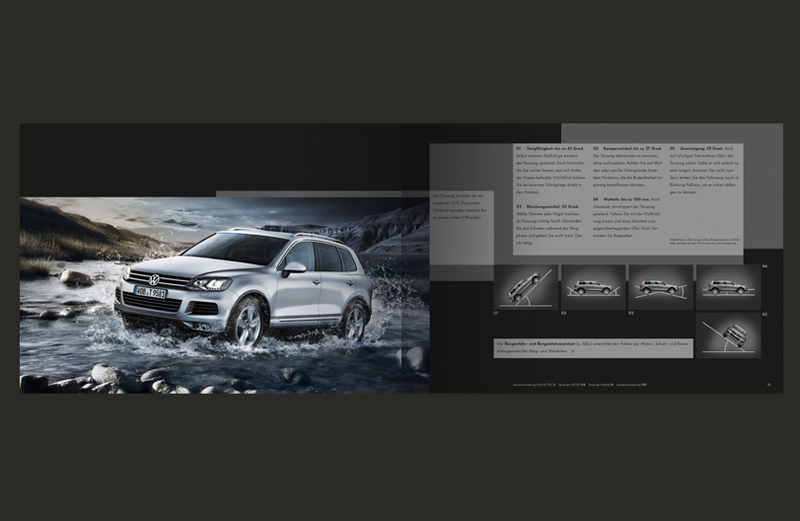 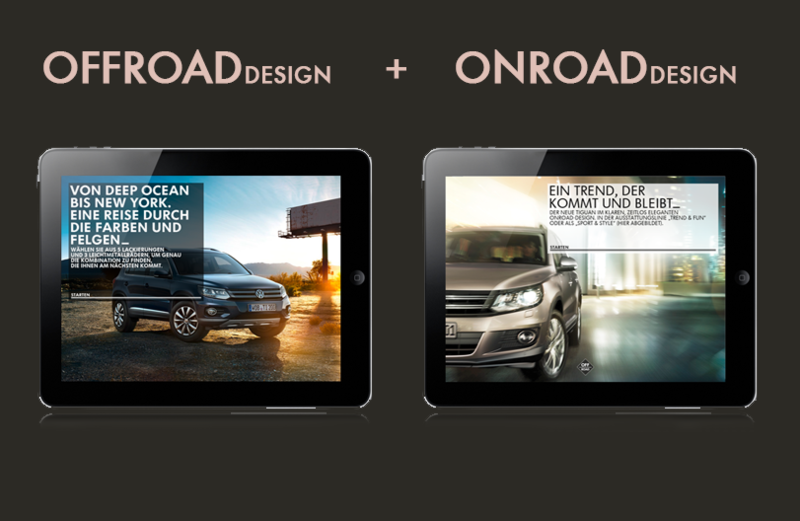 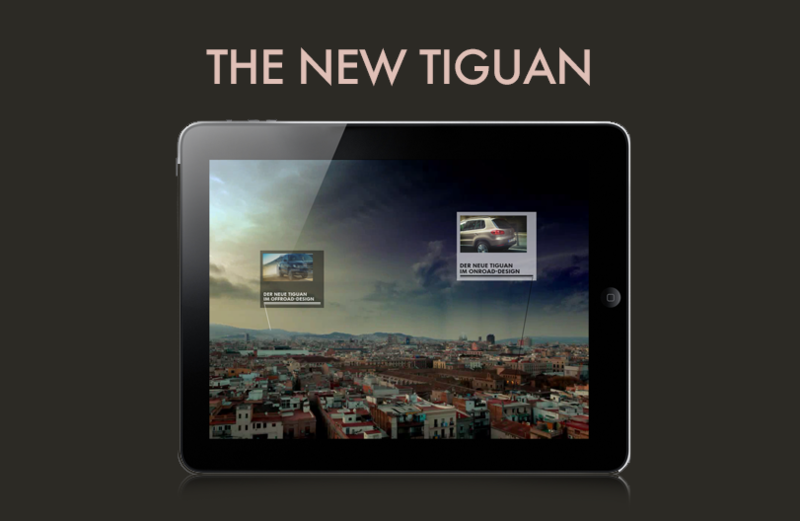 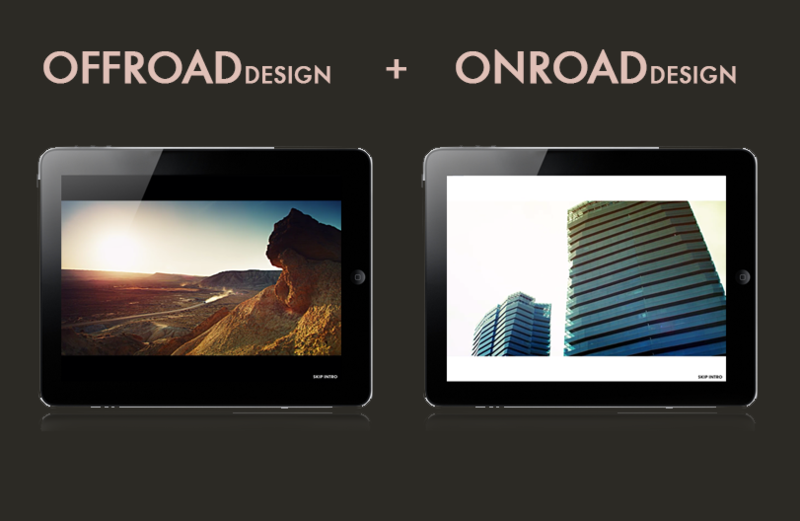 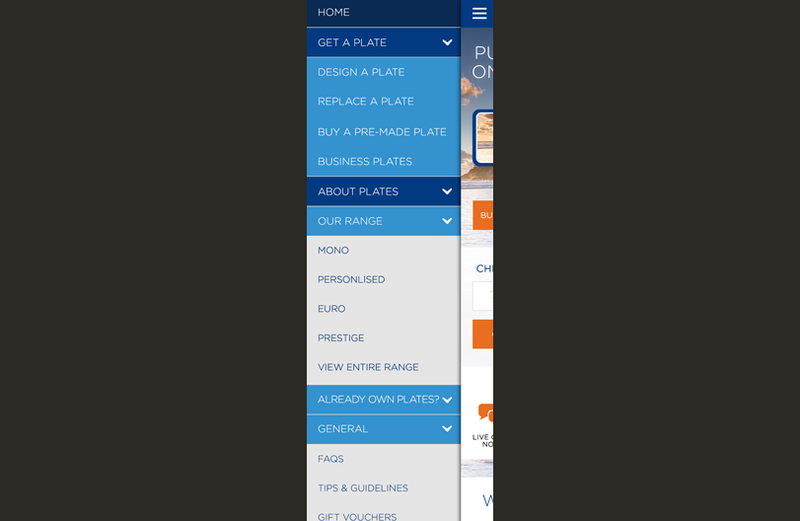 To launch the new Tiguan, we created this app to let user experience both ‘faces’ of the new Tiguan – the onroad and offroad part . 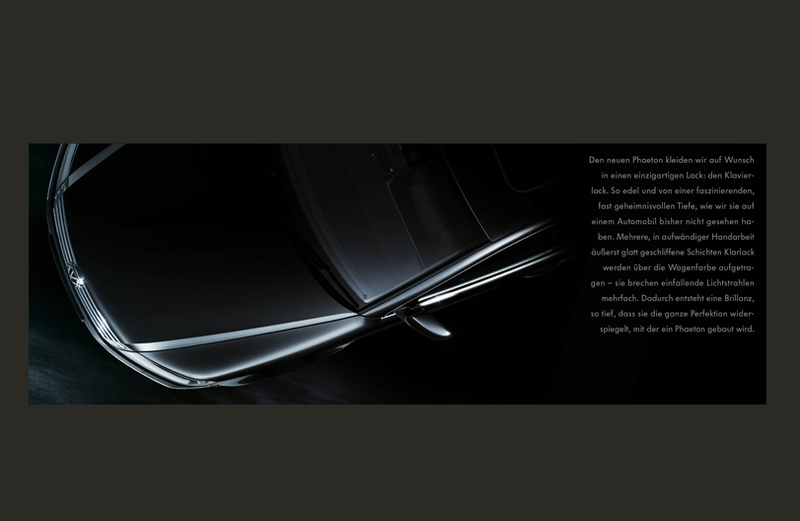 These 2 sides – the dark and adventurous one and the elegant and design driven one – attend the user within the whole application, where he can jump between those characters and their functionalities on every single point of the experience. 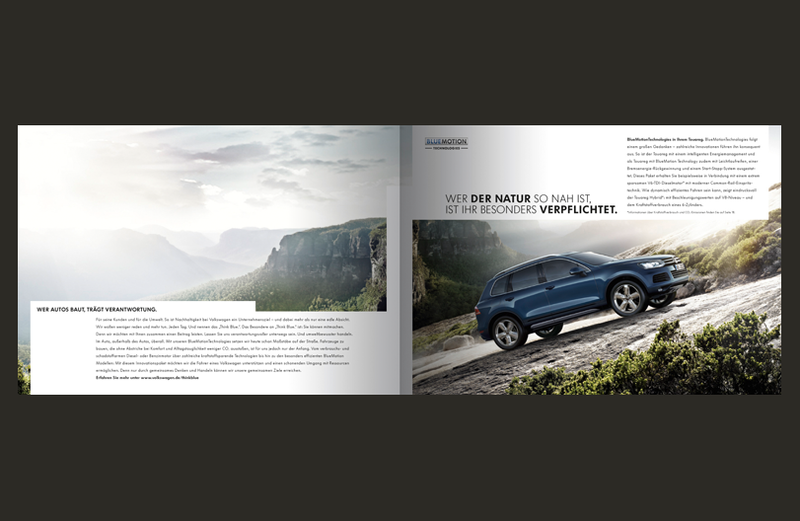 2 different faces – but only one car! 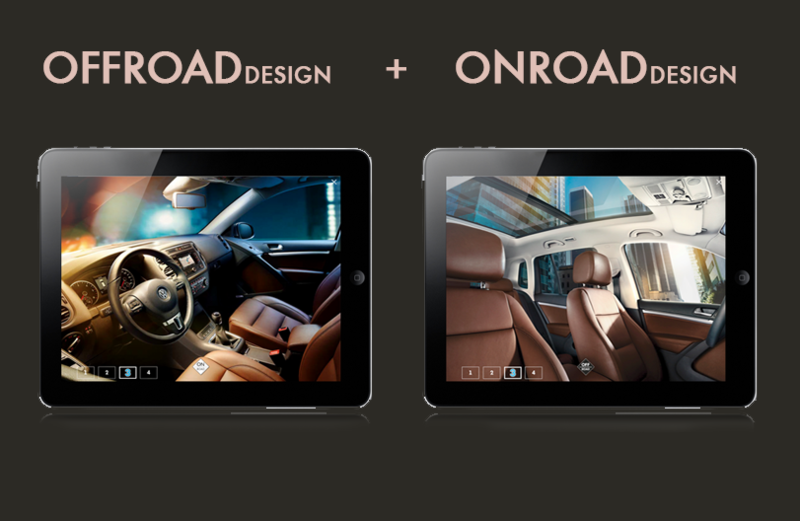 Get inspired, entertained and be revited by this personal kind of testdrive. 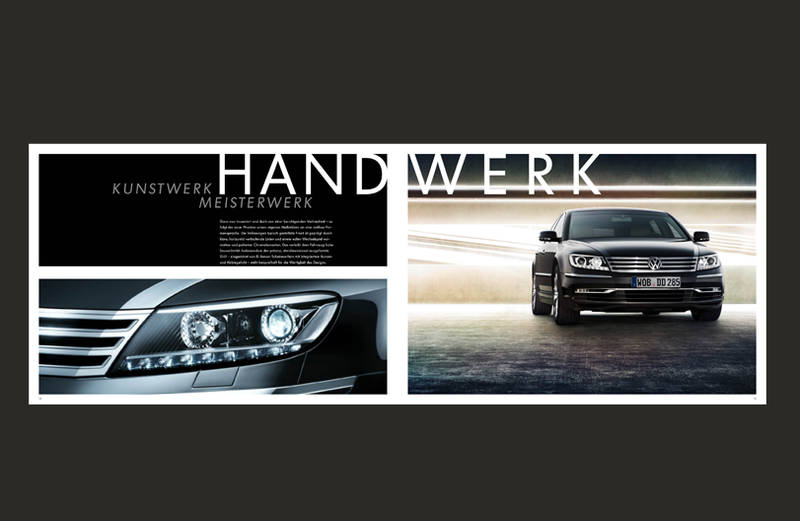 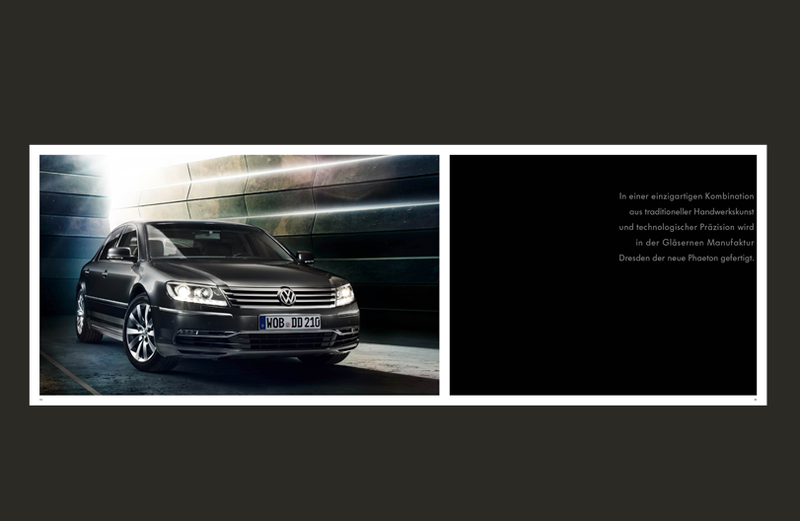 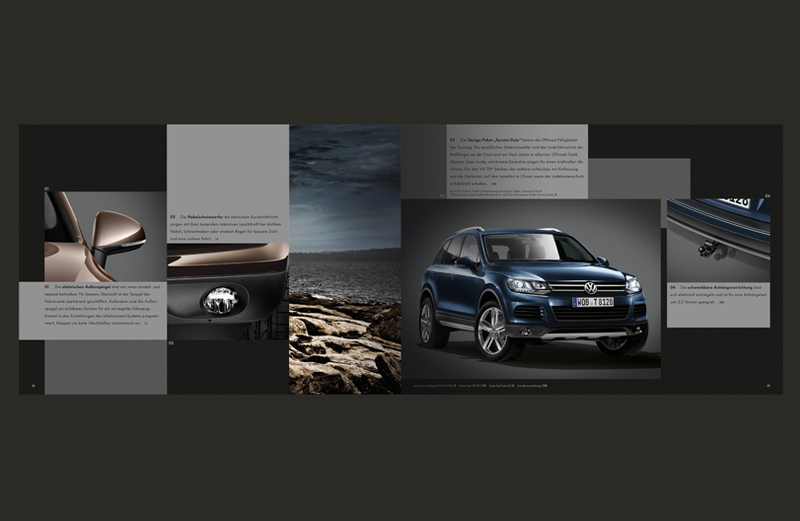 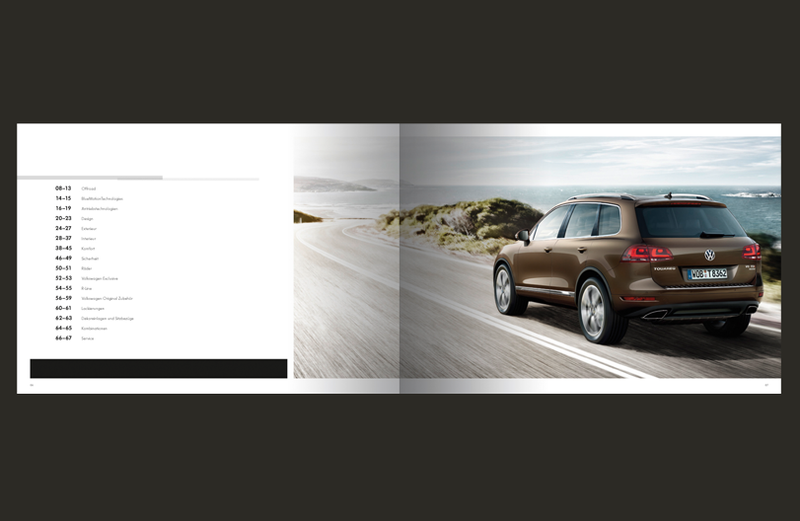 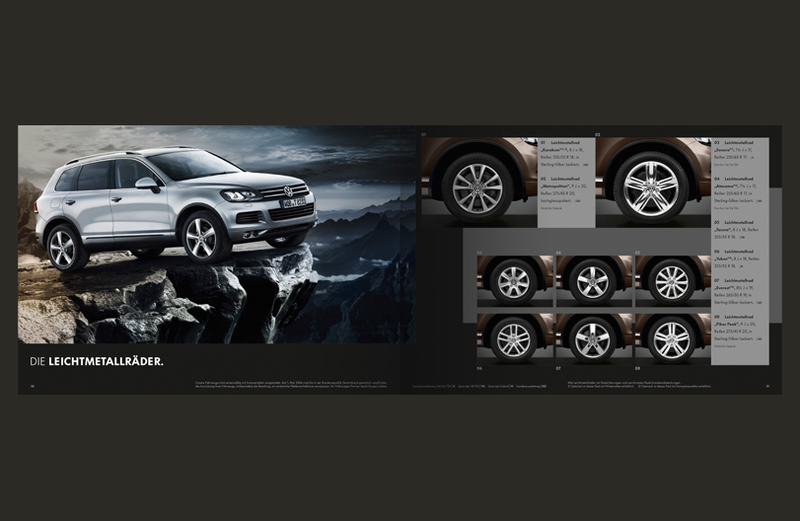 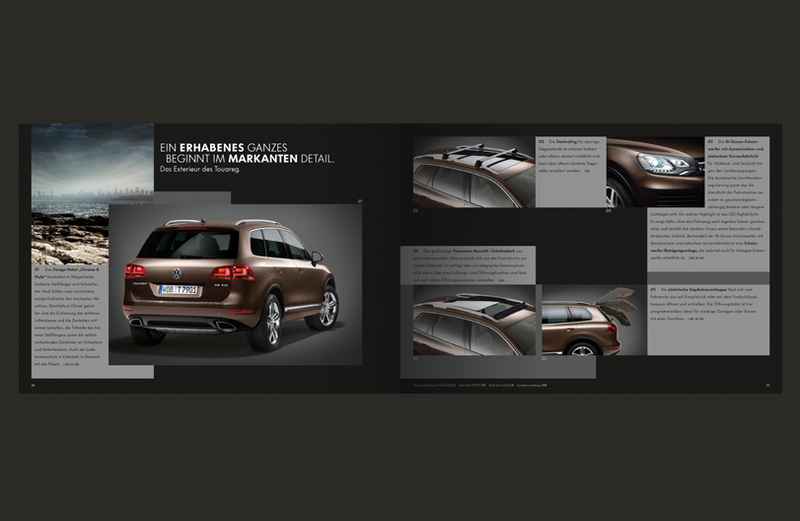 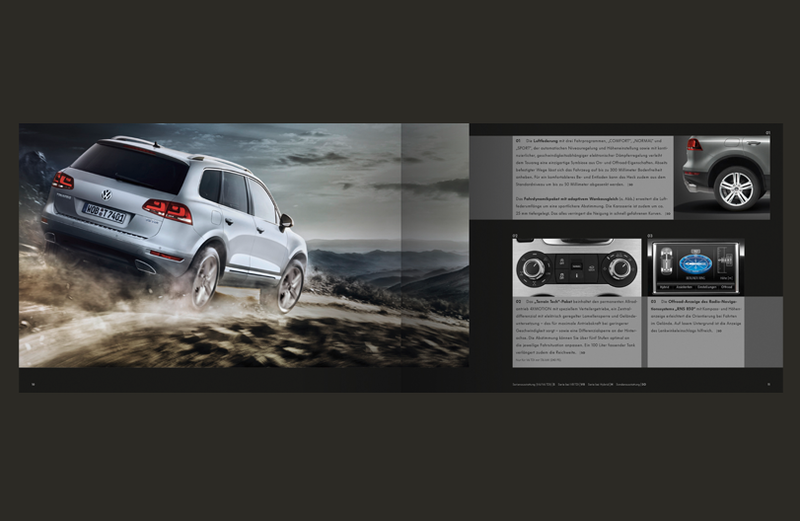 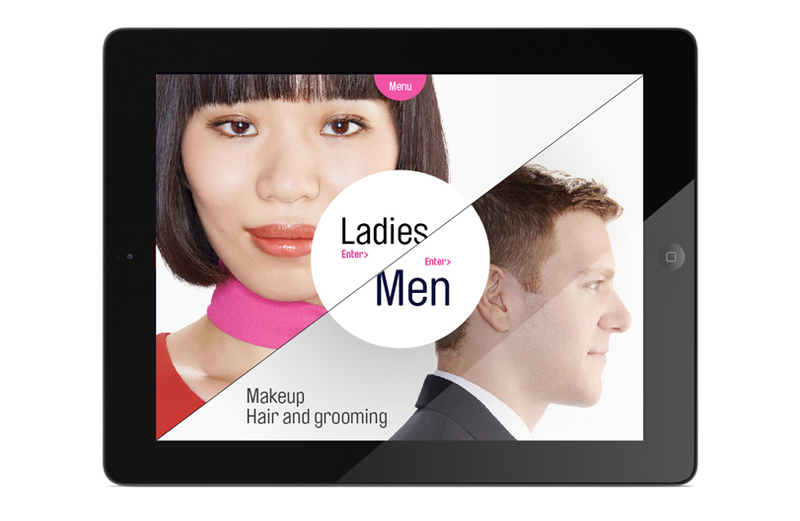 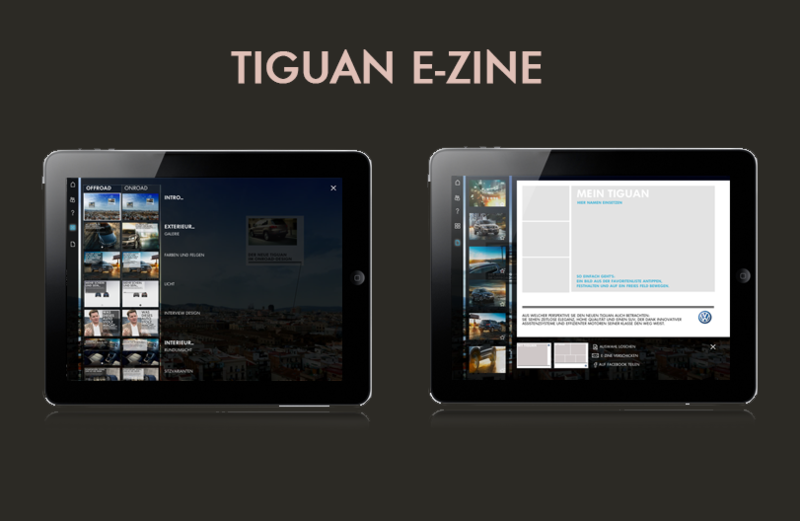 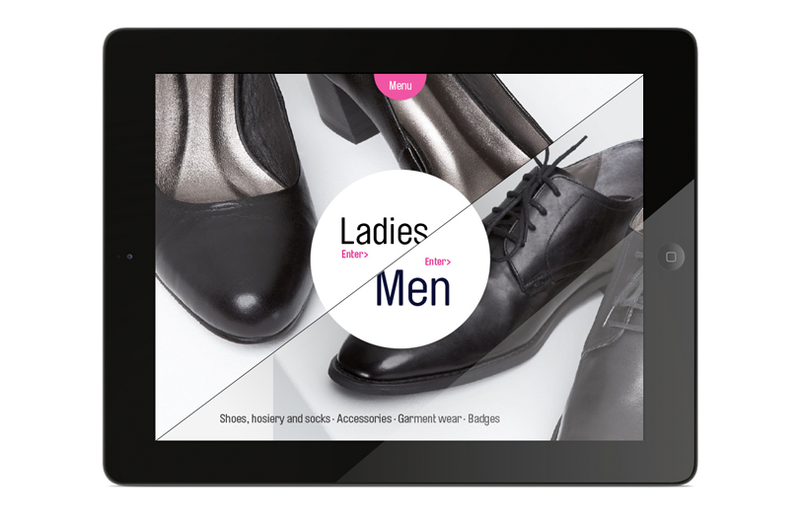 Based on your likes within the experience, the user is able to create his own Tiguan E-ZINE, your personalised digital catalogue. 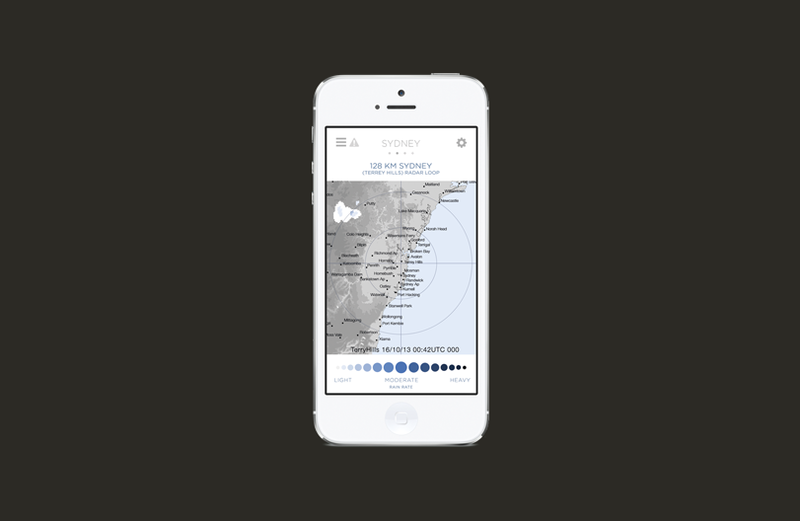 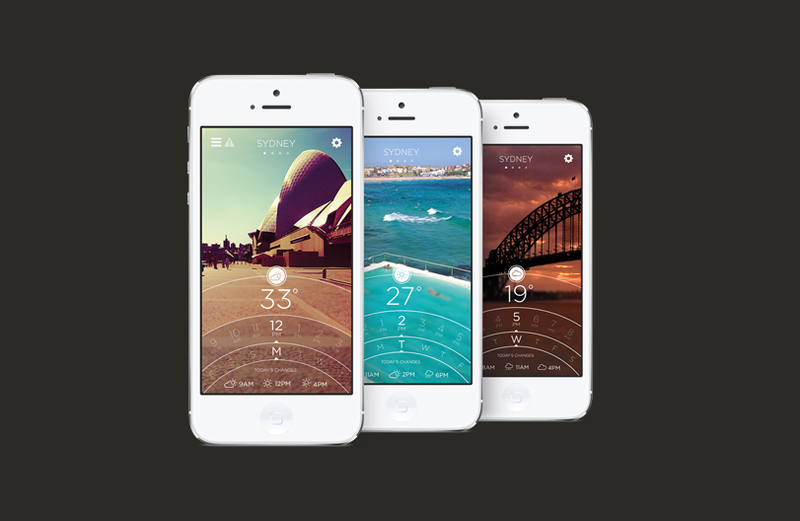 With the BoM App we wanted to create the best of two worlds: proving valuable, accurate and powerful weather information, whiles being simplistic in use, intuitive and rich in beautiful visuals. 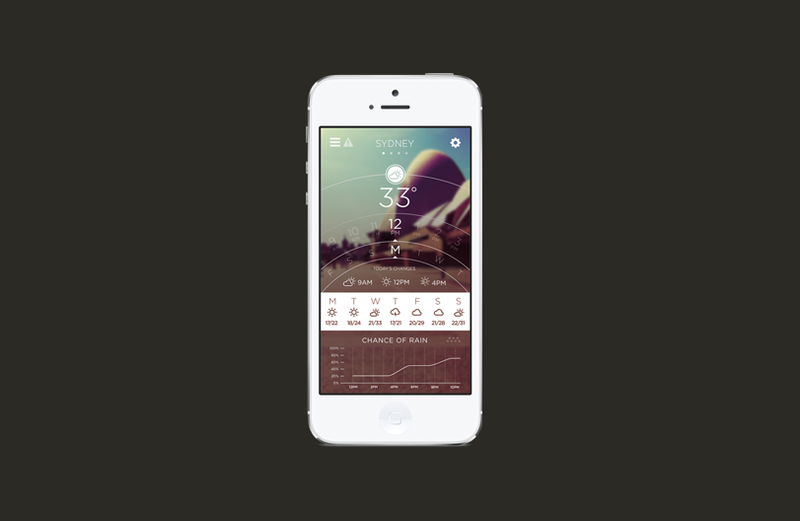 We also invented the DIAL – the dial has been used to reflect the arc in the sky that the sun takes each day, which also intuitively represents the top of a clock dial. 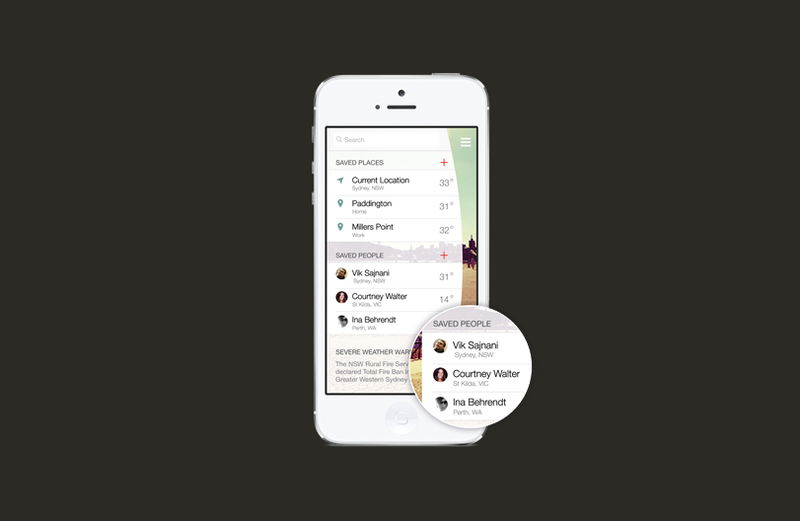 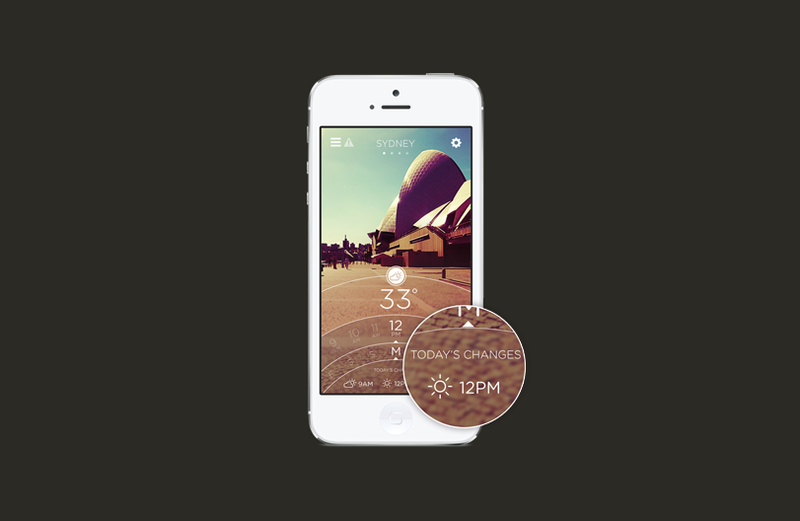 This subtle navigation design element can be used to quickly jump to a day or time in order to get more accurate view of conditions. 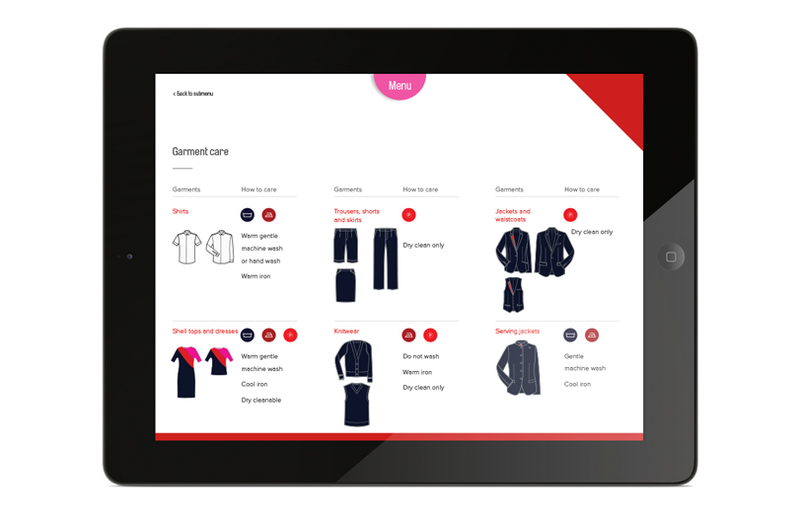 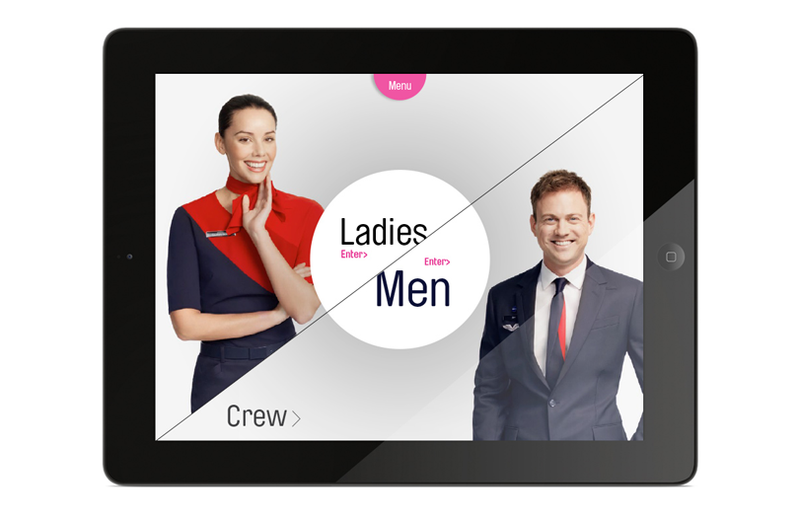 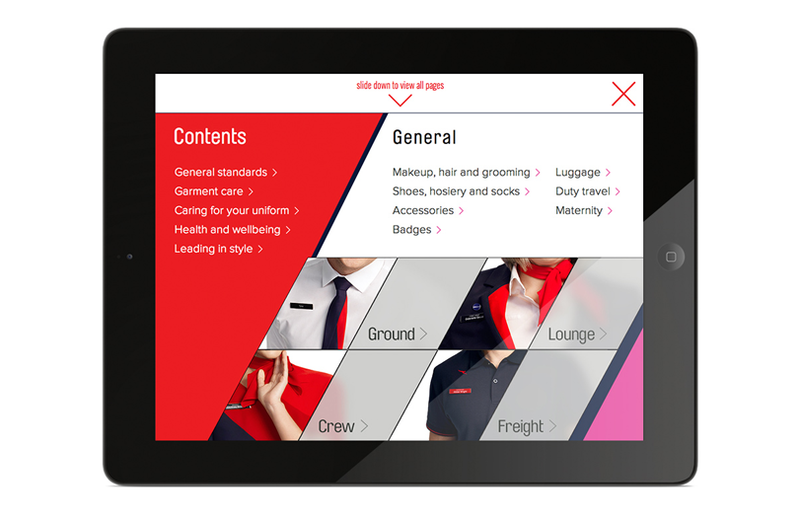 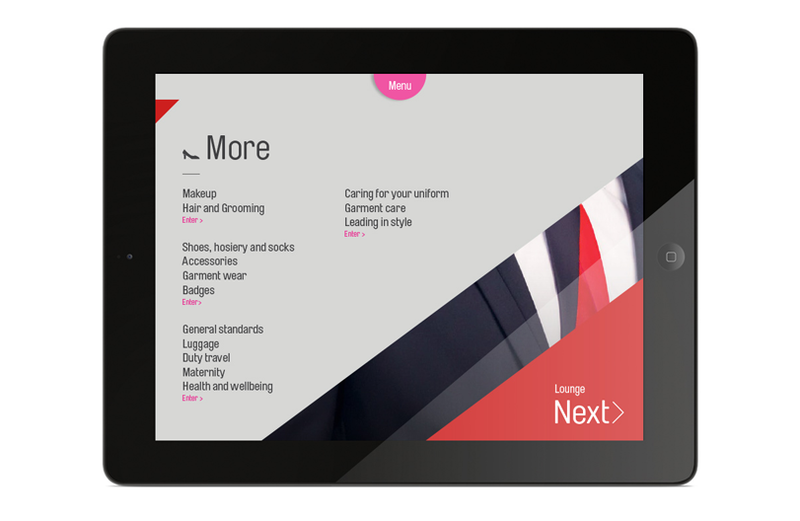 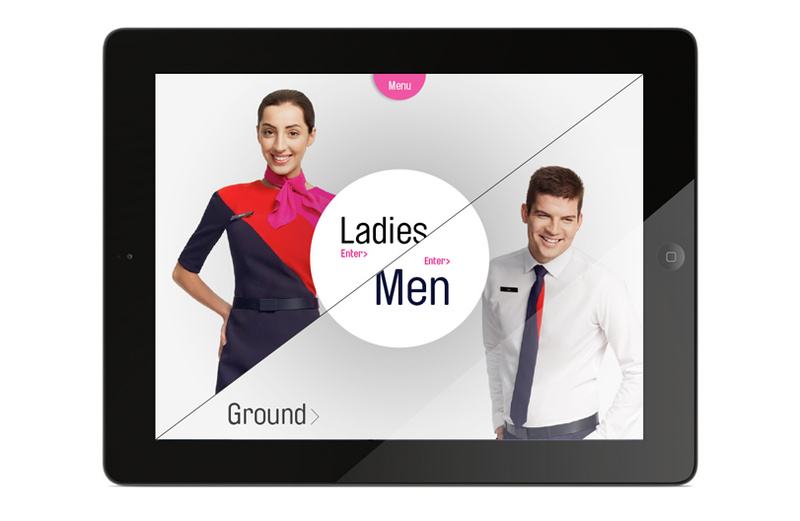 Qantas has a proud tradition of working with some of the world's best designers to develop uniforms for their team. 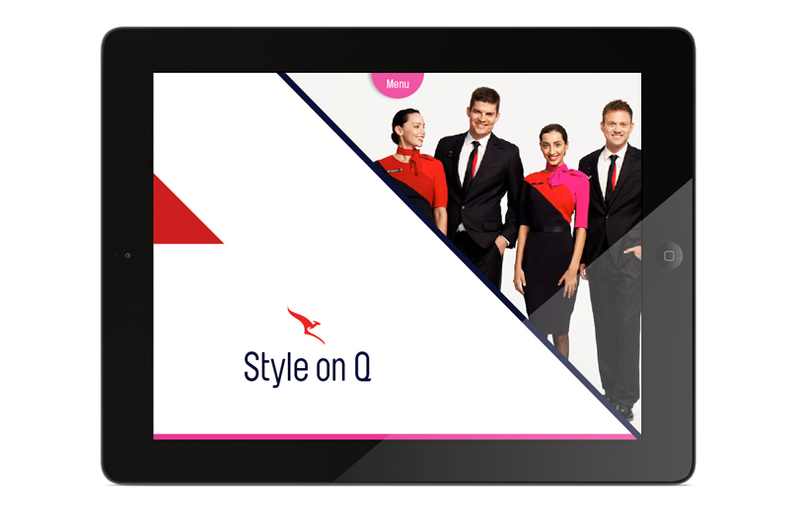 Since it first hit the runway in 1938, the Qantas uniform has been an evocative symbol of service excellence and the irrepressible Australian spirit of travel. 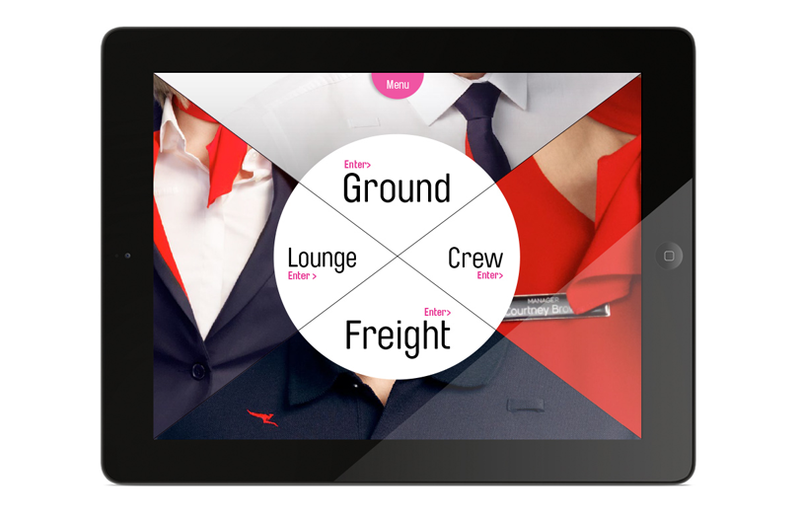 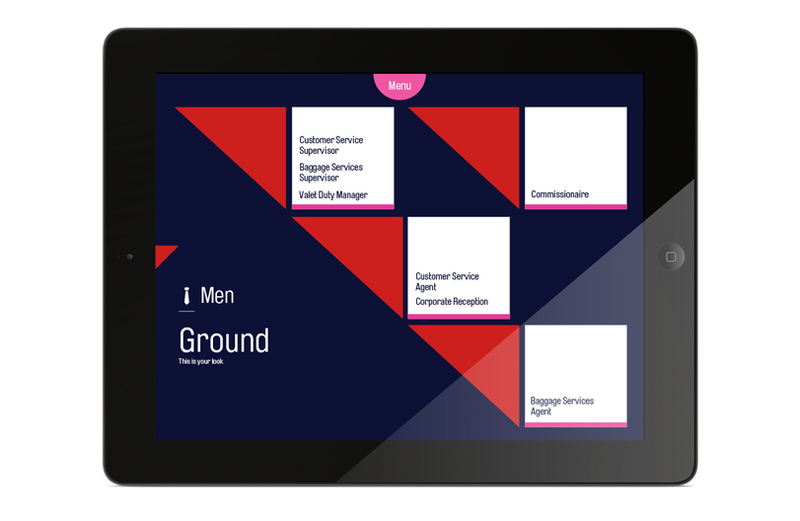 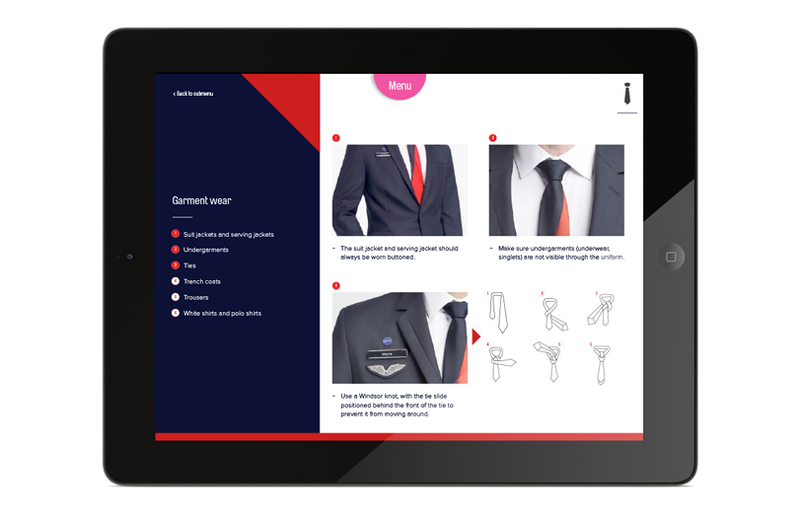 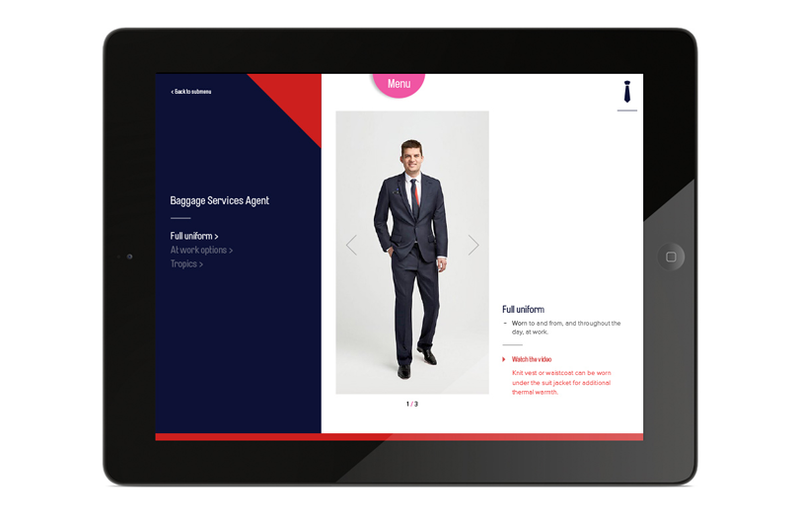 The new uniform is so much more than a new look, it marks a new chapter in the brand and will unite the people on the ground and our flying crew as "one team" – therefore Ina developed an outstanding Design-Styleguide as an App with various features, options and ways to style. 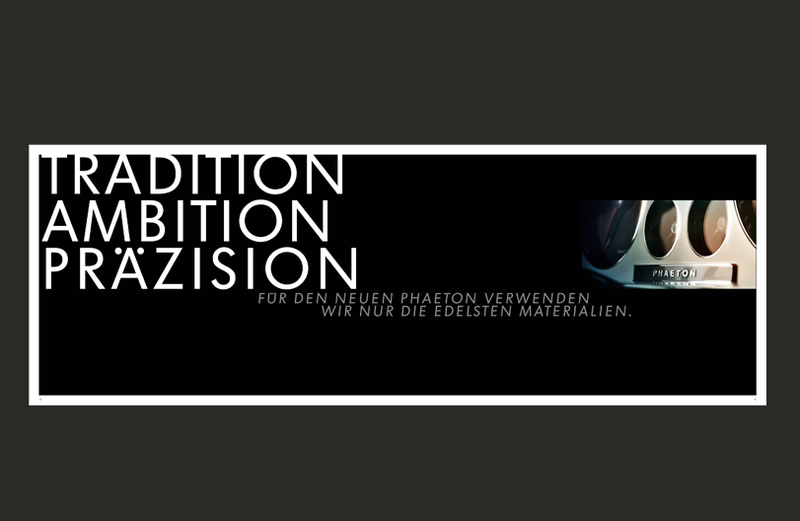 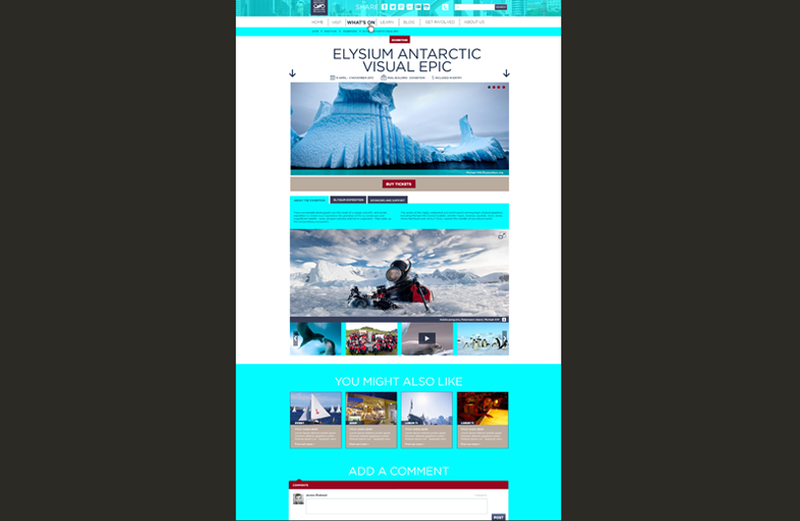 – in cooperation with Adobe. 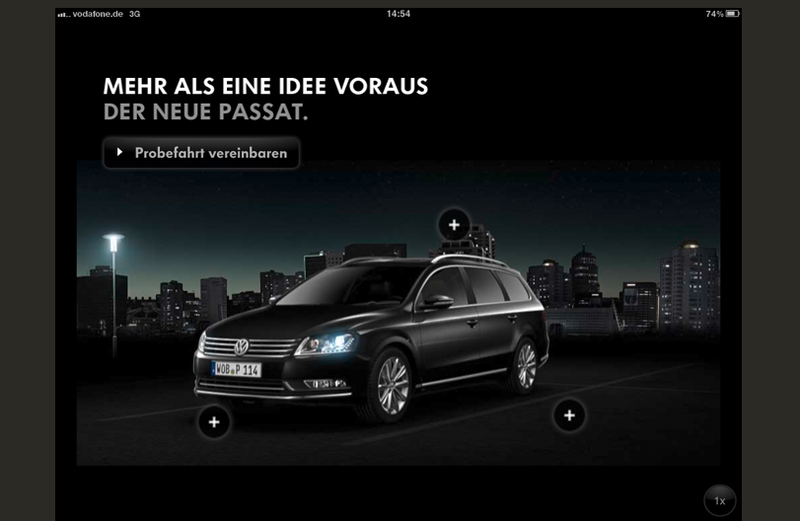 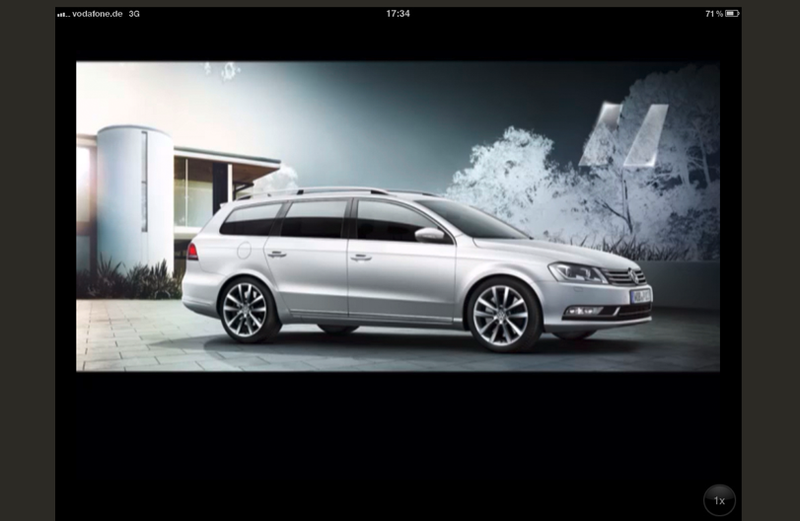 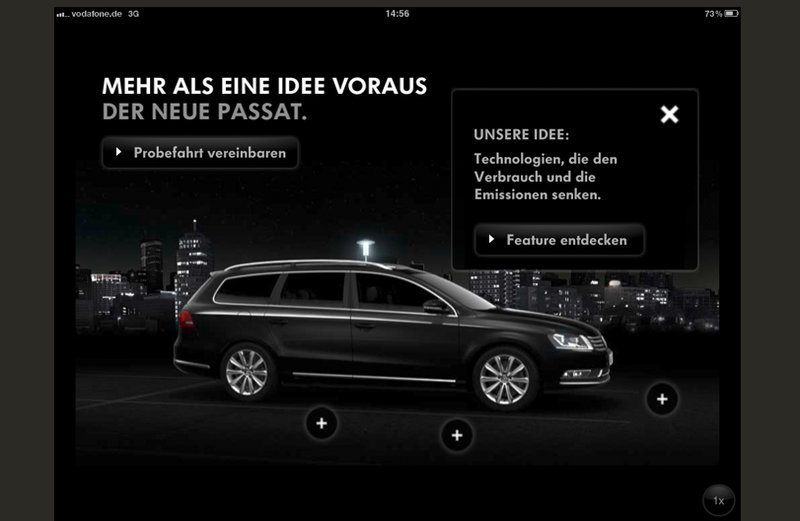 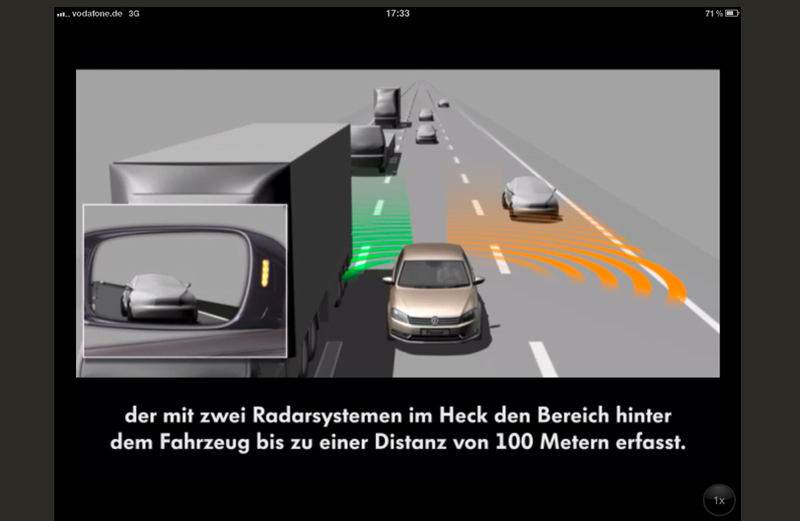 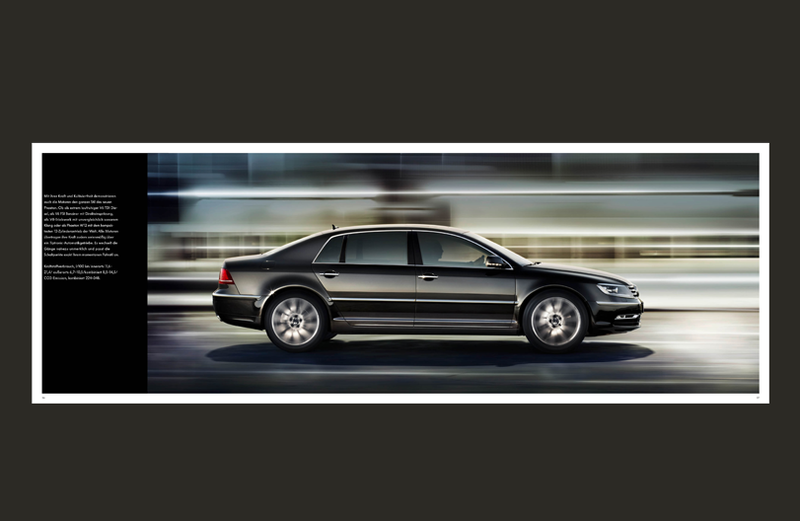 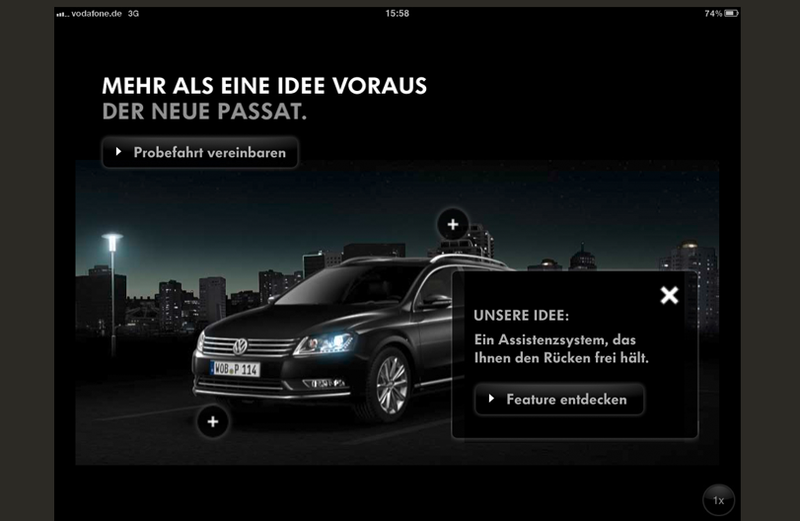 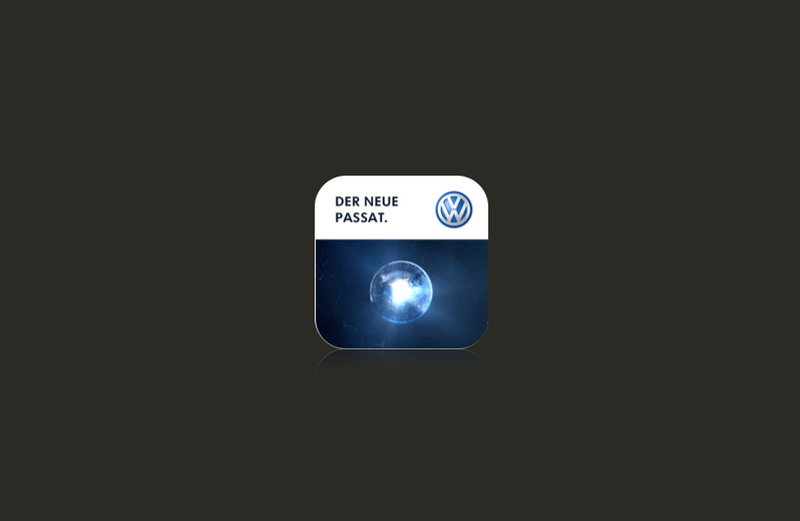 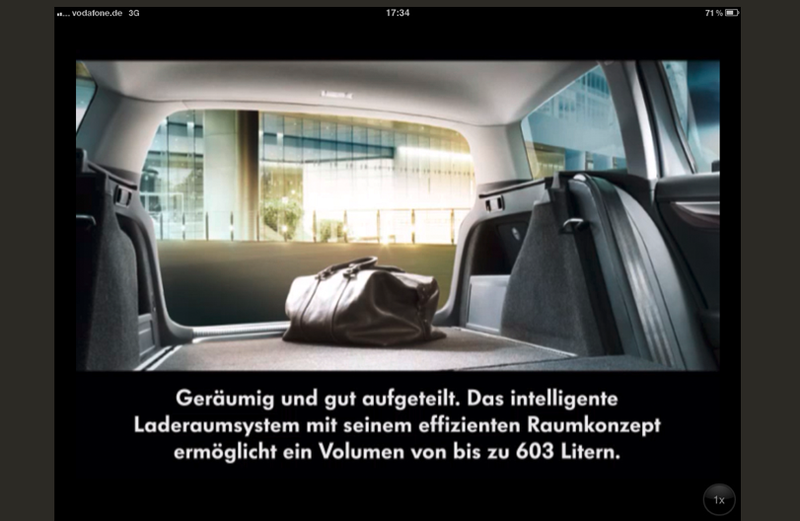 With the new Volkswagen Passat Variant App, the user is always a step ahead. 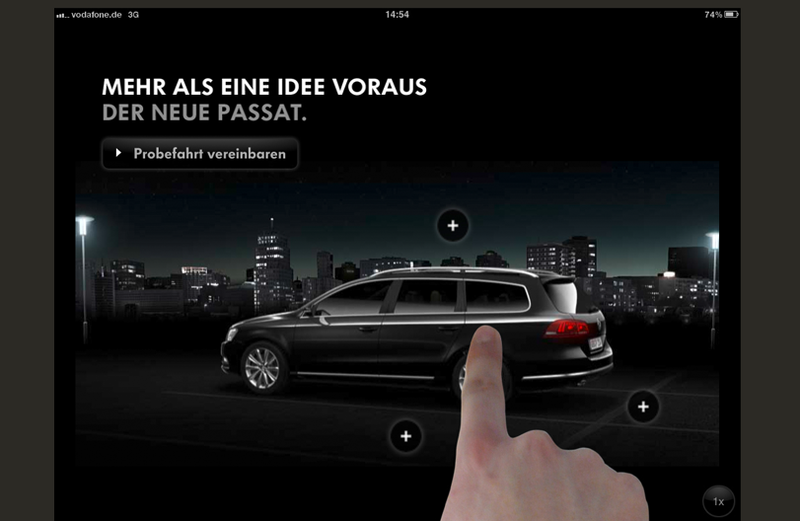 The user experience showcases the automobile from each angle – and with just a finger tip, you can discover even more and find all about its features. 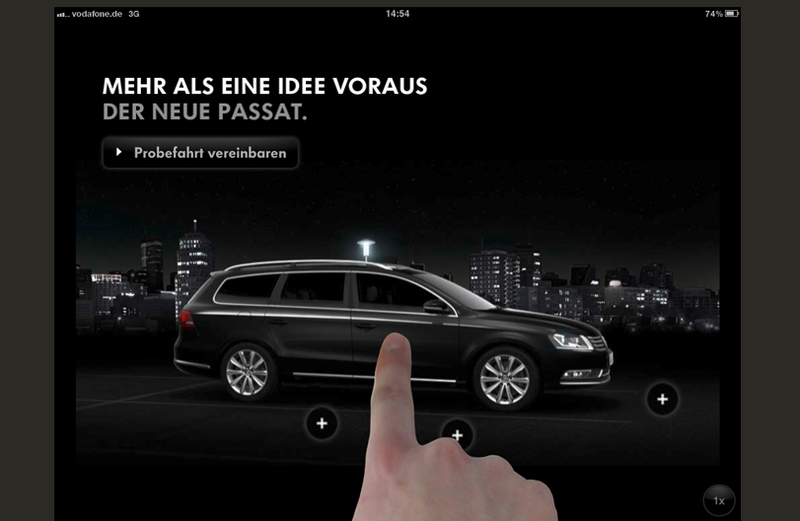 The user becomes the driver already at this stage and can experience the new Volkswagen Passat Variant. 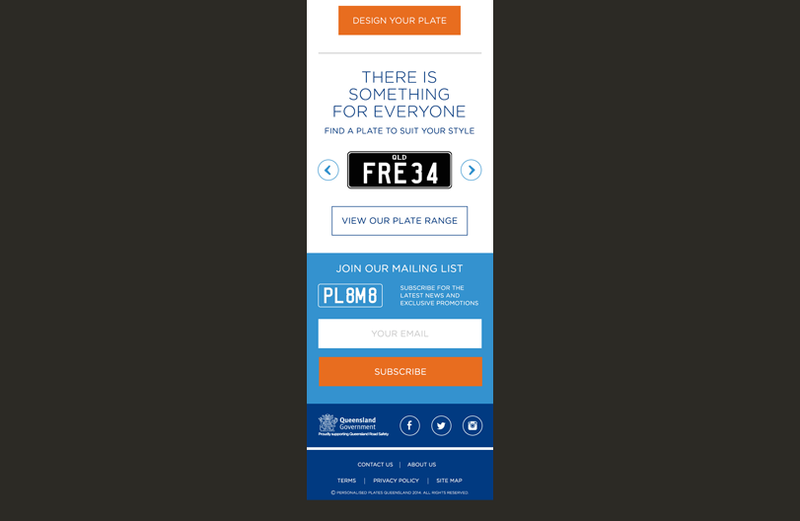 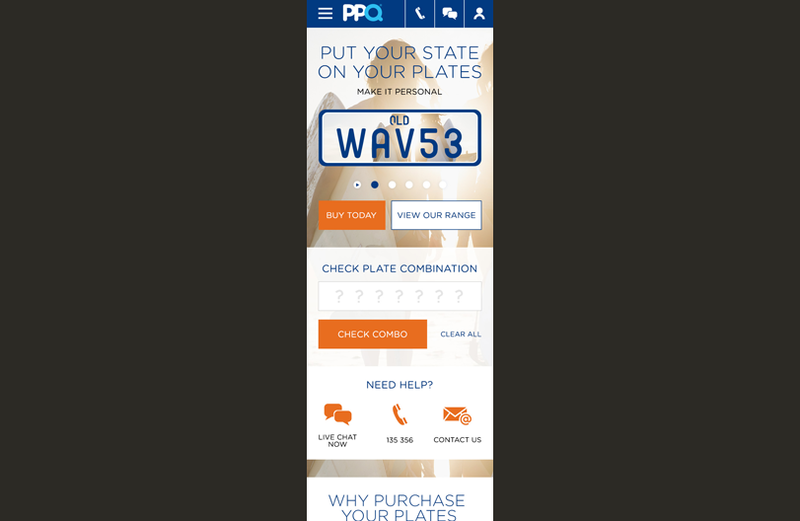 Personalised Plates Queensland briefed us with the development and design task of their various online channel. 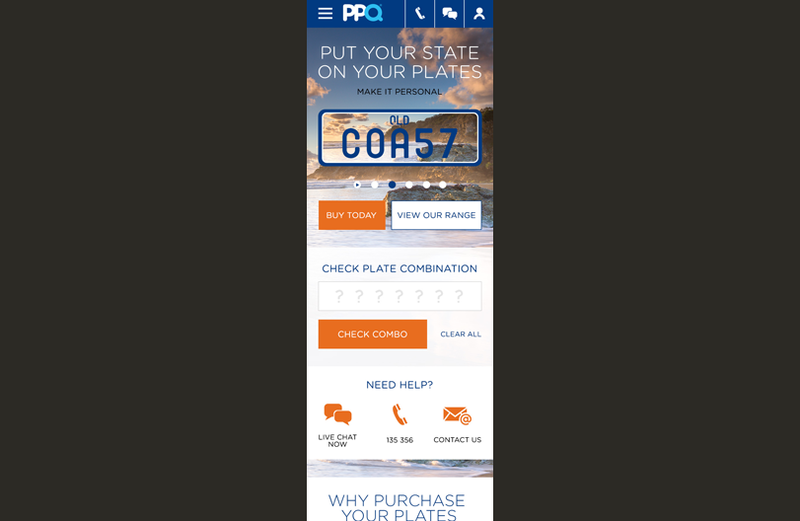 Their mission statement is to build upon of the successes of the existing website, to identify opportunities for imroving key message consistency and delivery, to provide the most dynamic, engaging and enjoyable experience possible for customers across all popular web platforms to bolster the PPQ brand and drive growth. 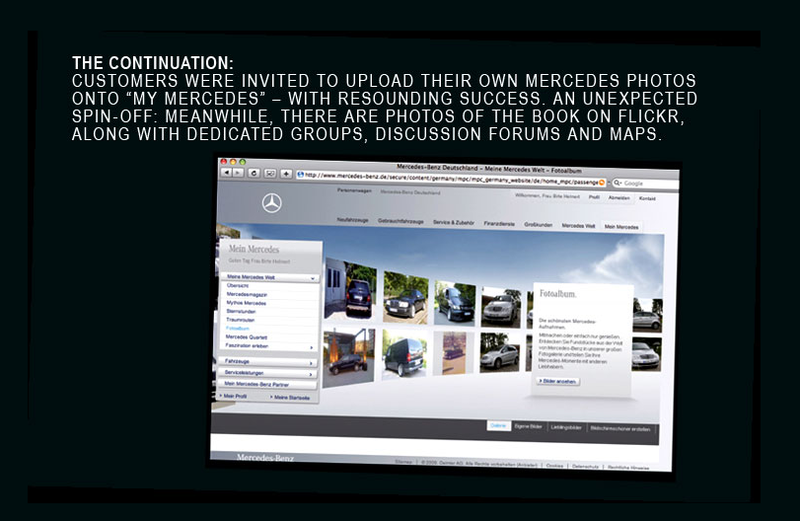 In order to create a campaign that strengthens customer loyality, we found out that on flickr.com, there are well over 100,000 images taken by amateur photographer from all over the world that portray Mercedes automobiles au natural, in an often sponta- neous but always affectionate way. 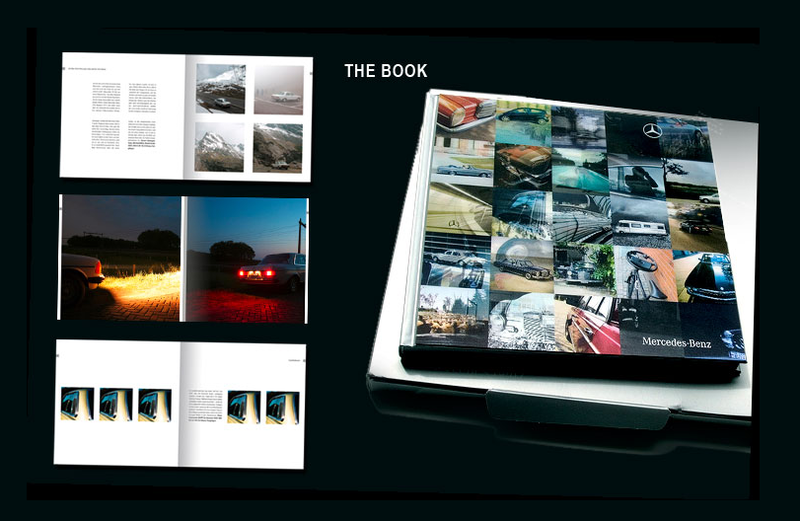 The idea was simple: to compile the most offbeat flickr photos in a coffee-table book. 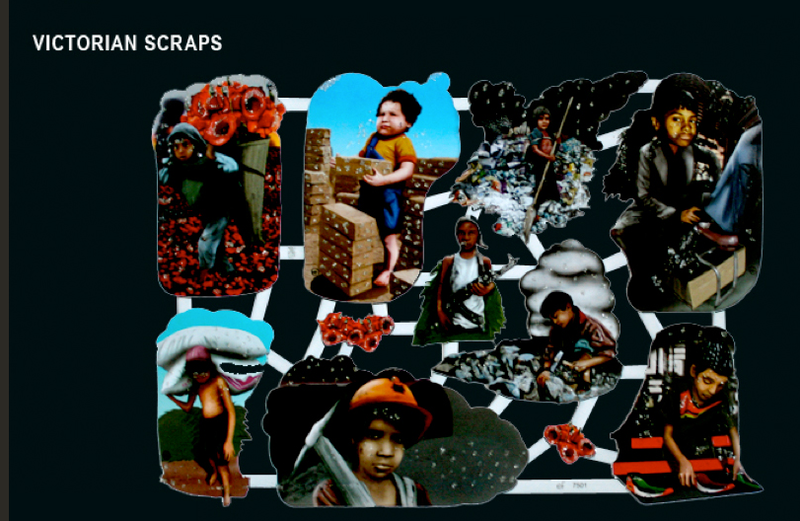 To this end, we asked selected photogrphers to send us their image and to tell us how it came about. 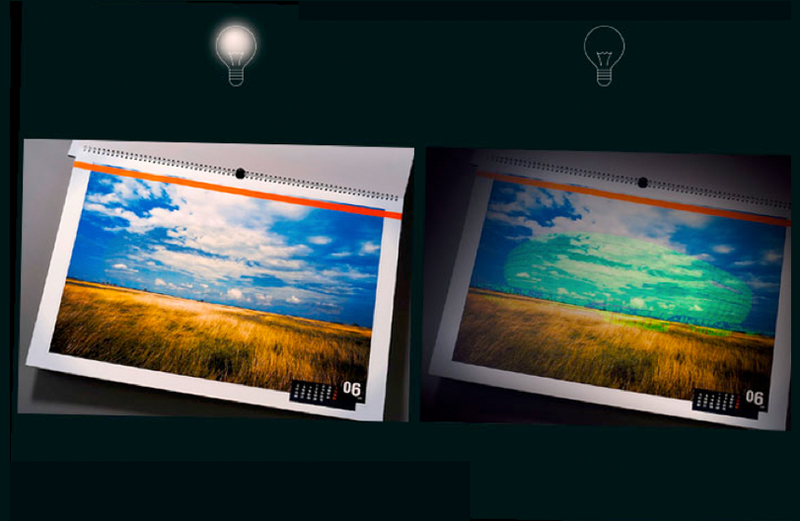 We used both without any additional editing. 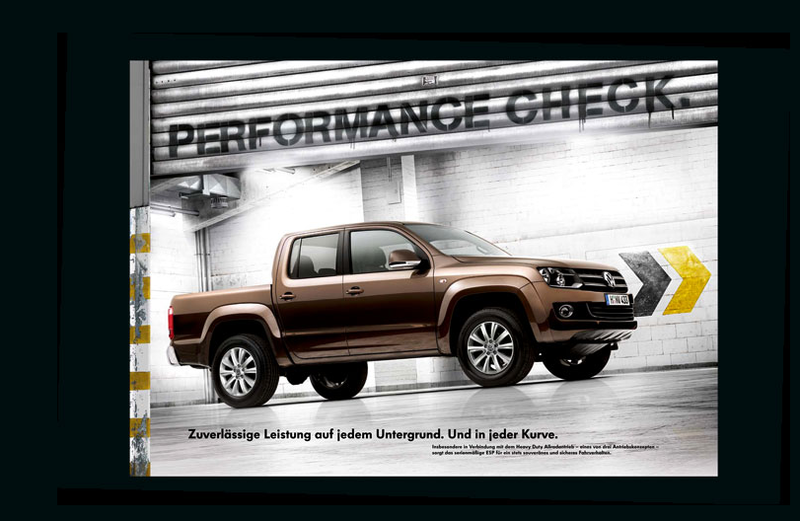 The first Pick-Up by German Engineering had its world premiere in December 2009. 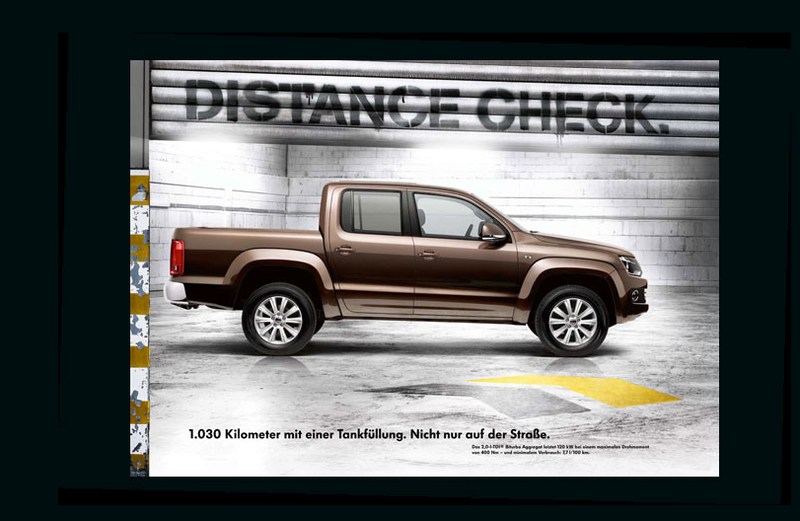 We sighted secret AMAROK testing material in a special AMAROK-Force team. 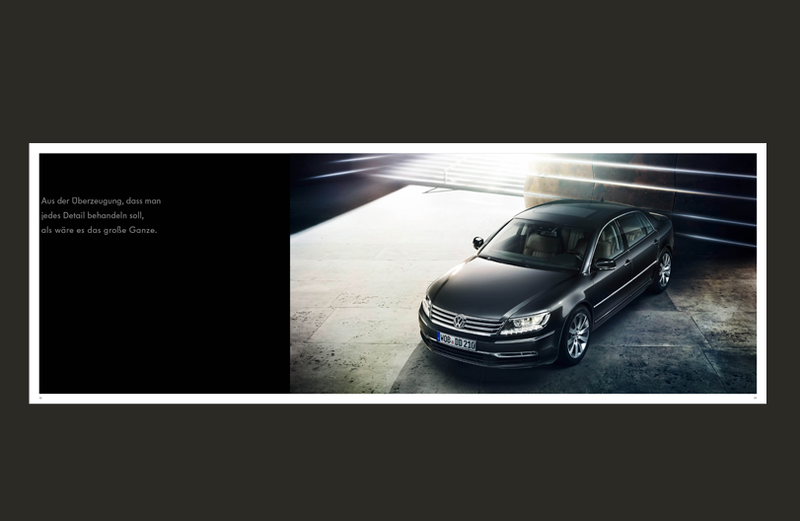 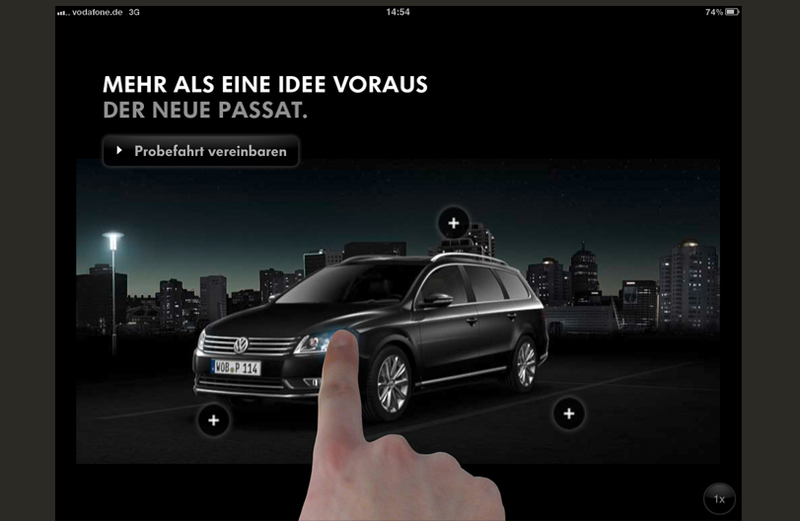 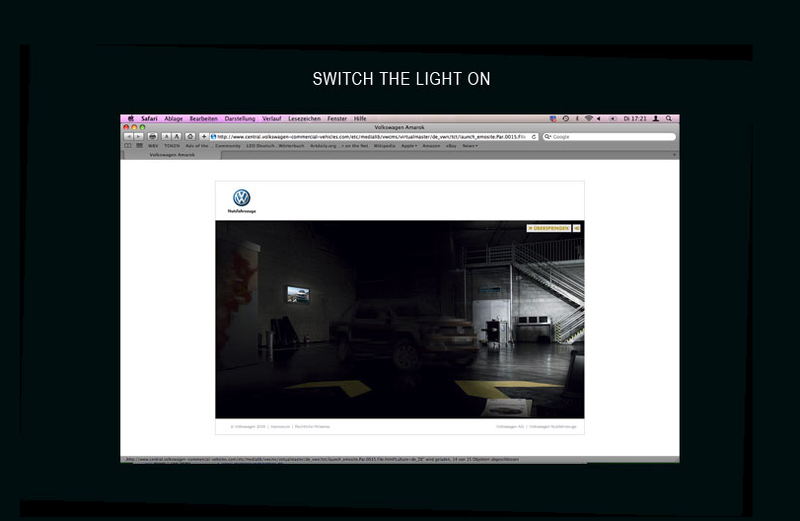 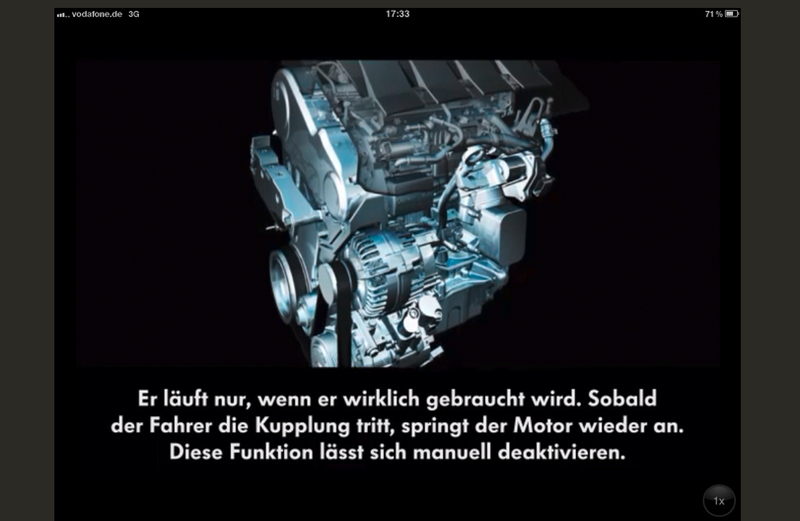 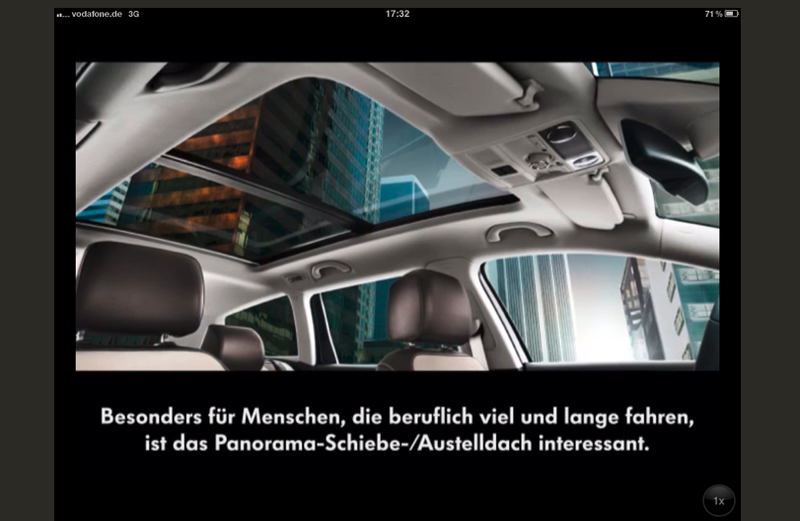 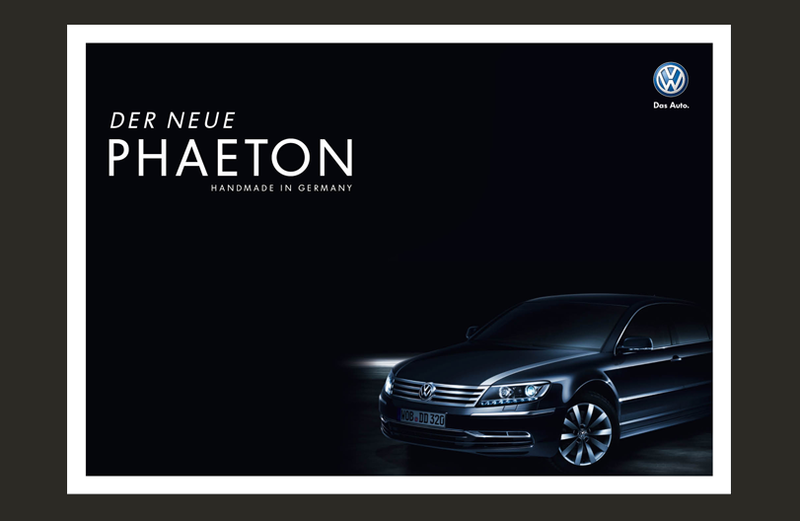 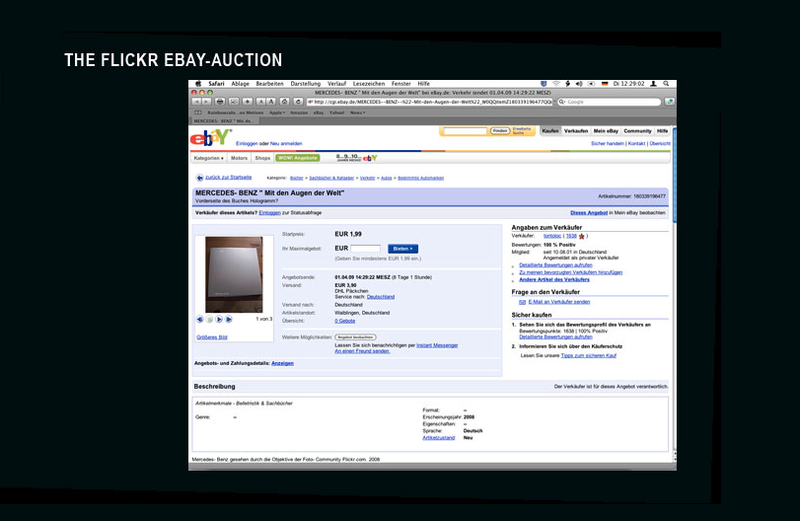 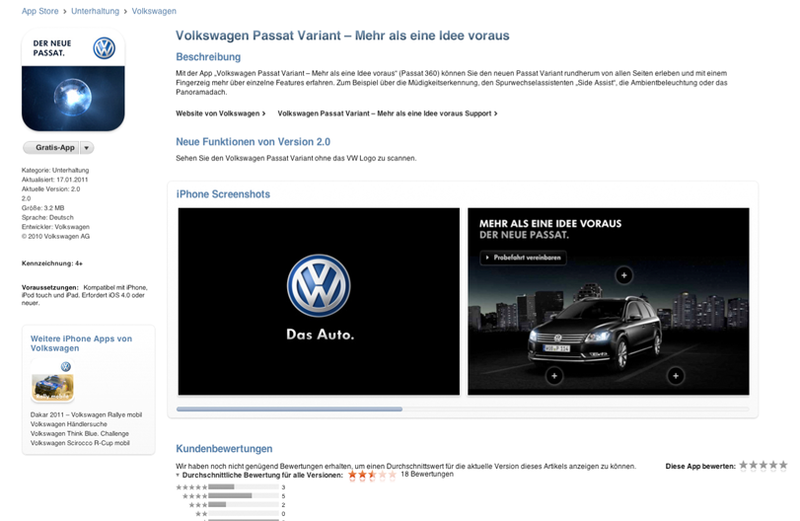 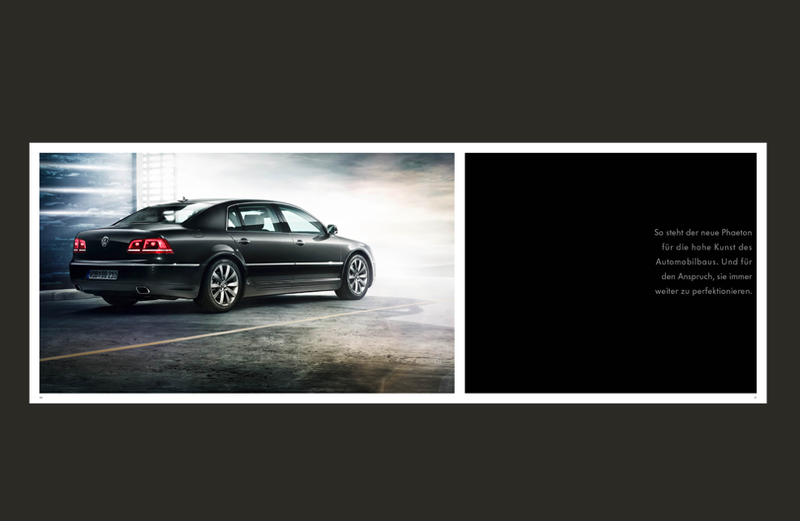 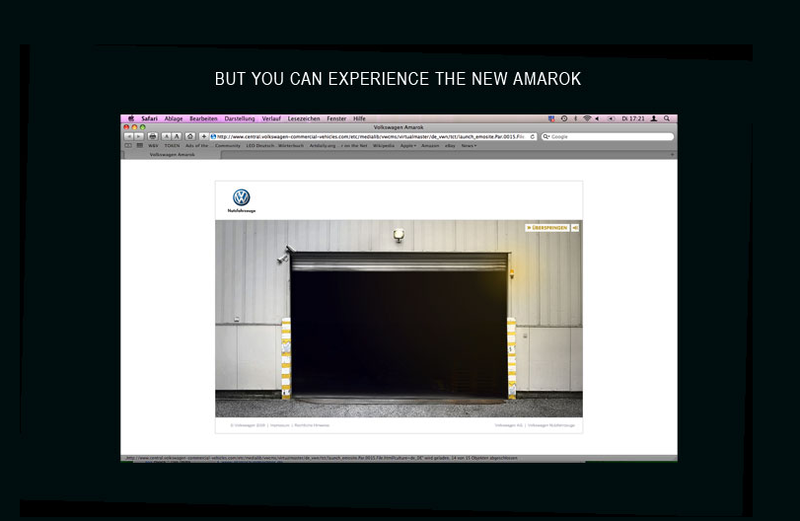 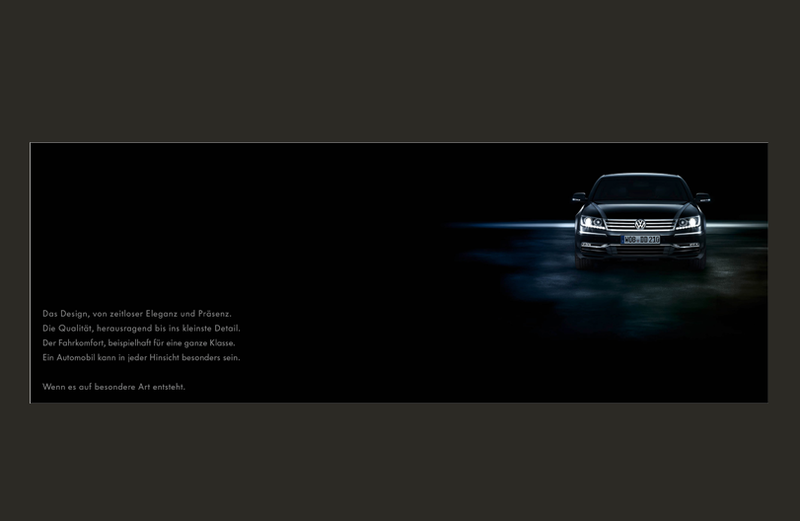 The only time in the history of Volkswagen – we put it online even before the premiere. 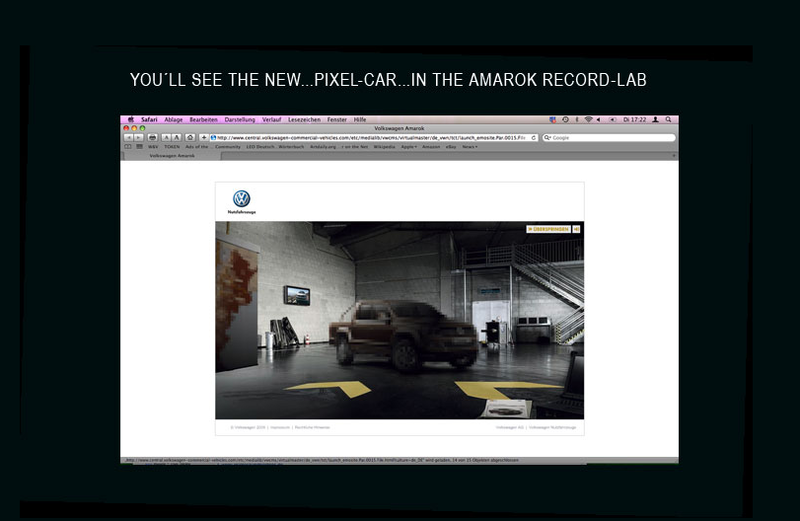 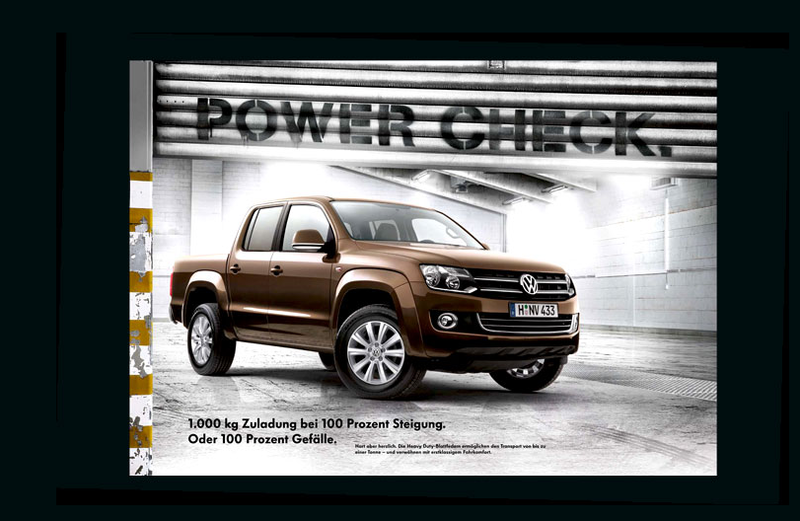 The chief attraction: The AMAROK is pixelized and each pixel is showing contents of the record tests with again pixelized AMAROK. 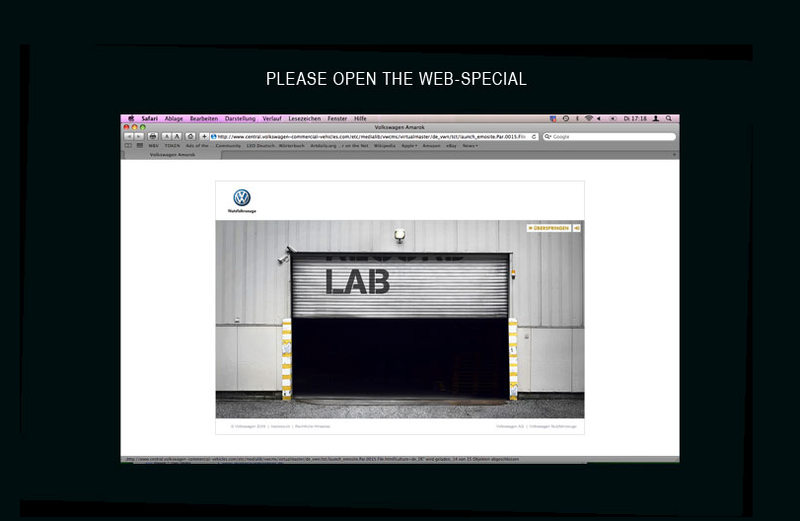 The countdown is running and bit by bit the user in the Record-Lab found out more and more. 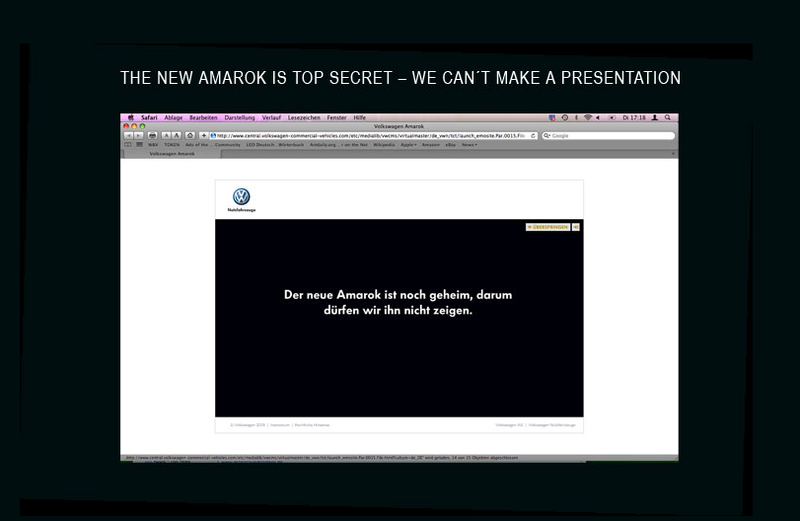 Also the hint that the AMAROK is official support vehicle at the Ralley Darkar in 2010. 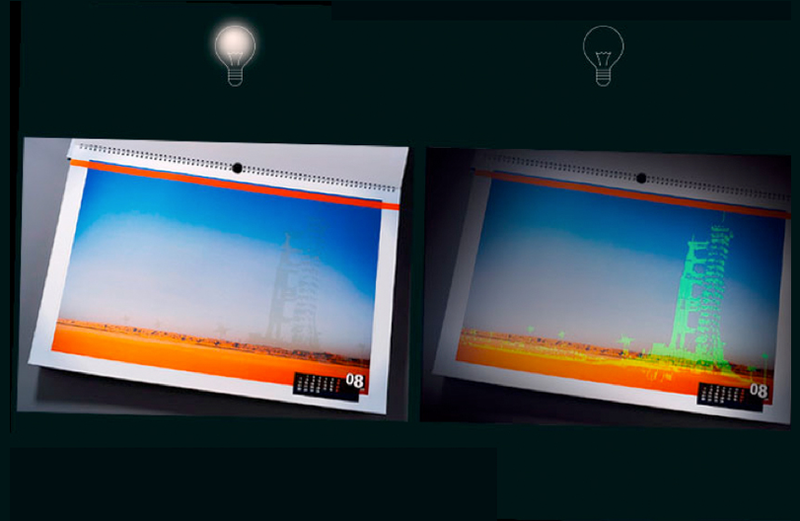 To show how OSRAM, as one of the world’s biggest luminophore esperts has positively lightened up the worls in the last 100 years, Ina created a calendar that is showing general landscapes 100 years ago and is demonstrat- ing the fll power of OSRAM at night – switch the light off, you’ll see OSRAM experience. 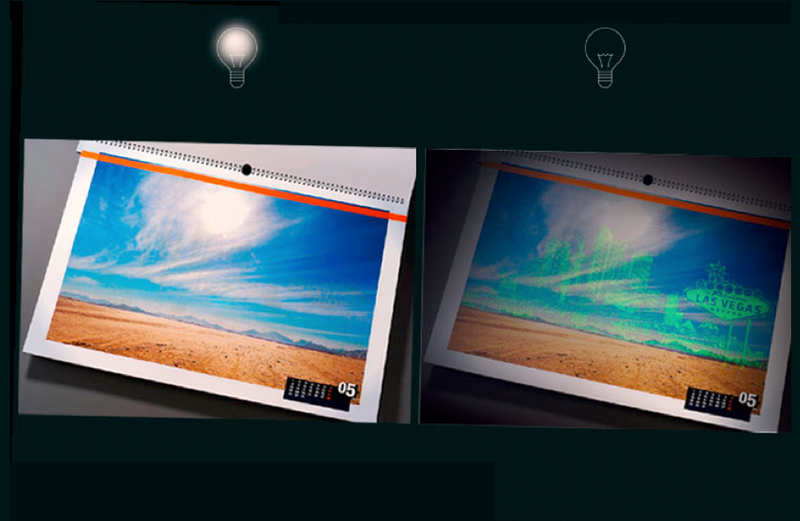 With the fluorescent and transparent printing ink, which invisibly loads itself in lightness, used for the OSRAM anniversary calendar Ina created a new print technique that has never been used before. 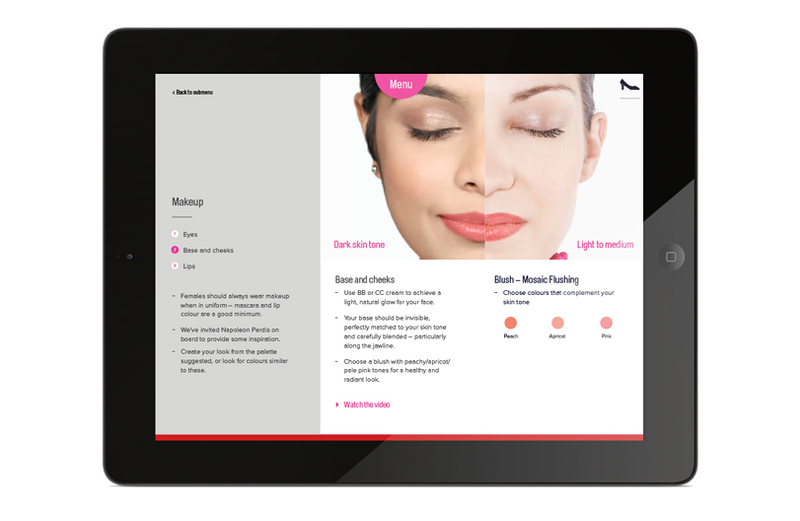 How does the russian midwife team advertise their services on childbirth the best? 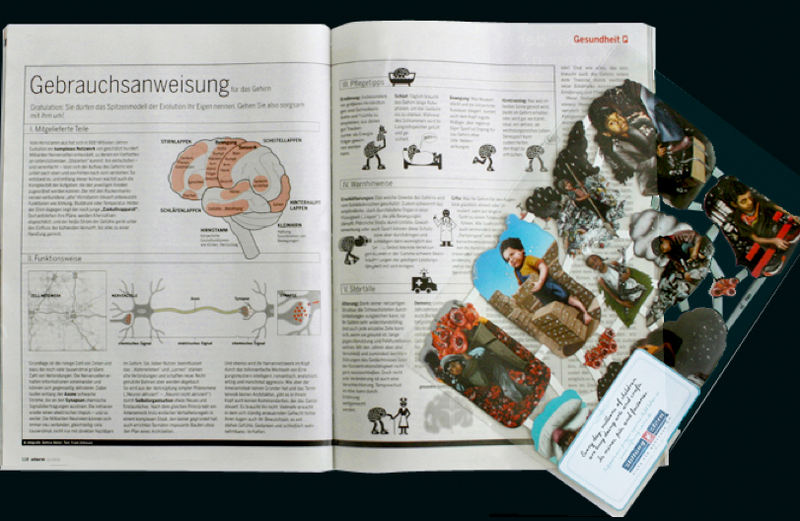 Business cards in the shape of a russian ‘Babushka’ that simulate a childbirth and that are actually business cards with contact details, when opening the perforation, literally give birth to the earth. 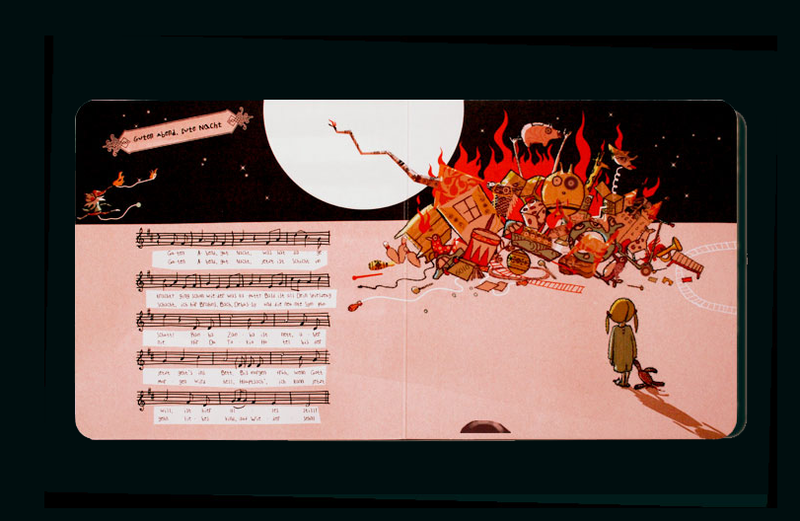 To run the ‘Symphony at 4’ with childcare at the Concert Hall Dortmund, we sent out a nursery rhyme book-mailing to young families. 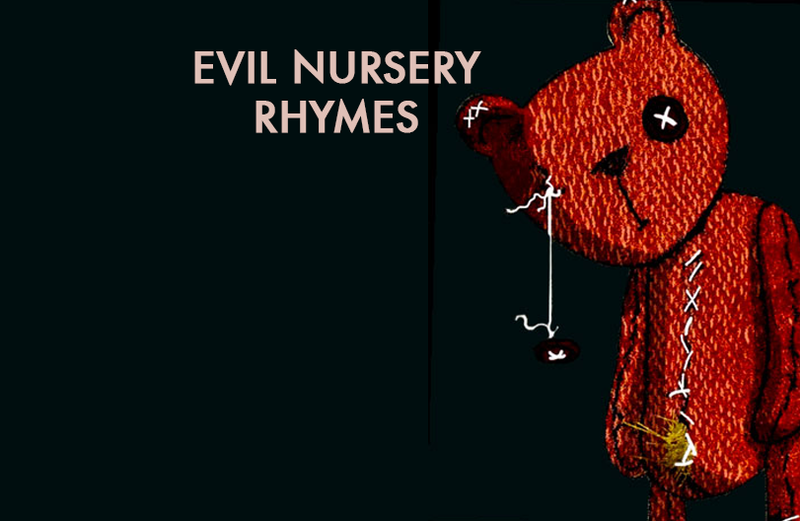 The chief attraction: The book contains well-known nursery rhymes that have been changed to evil ones: ‘Sleep, rug rat, sleep...’ and therefore show the benefit of a concert in combination with childcare. 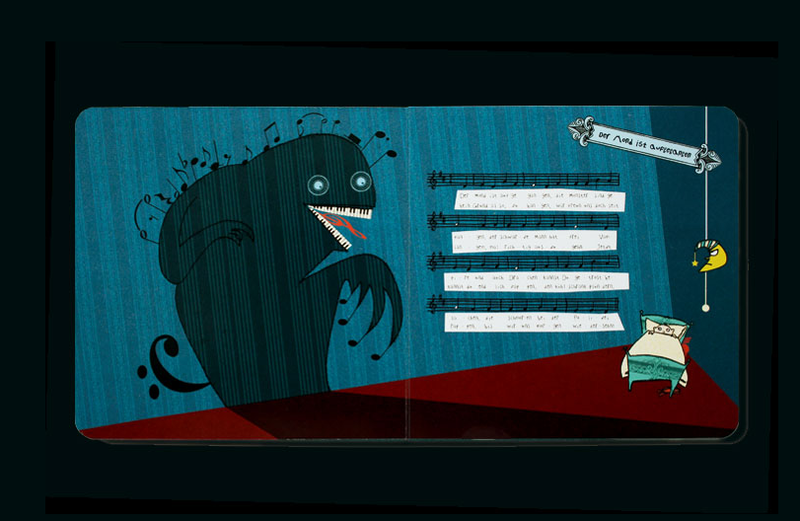 The campaign was so successful that the Concert Hall officially sold the book. 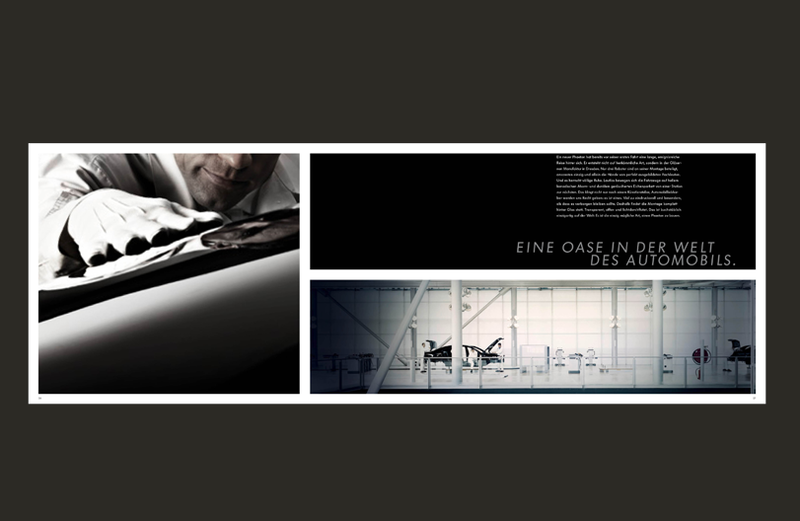 Semplicita means – reduced to his elegance, presence, quality and state of the art – these special book edition got handmade produced in linen and leather for each customer to make him feel special and showcase the handmade production of a Pheaton– underlined with the excellence of a clean, elegant design approach – a premium car for very premium driver. 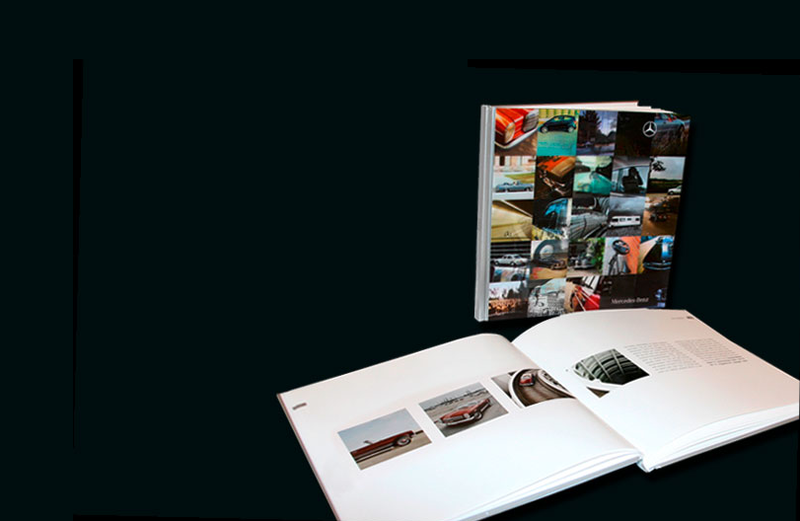 This book combined tradition, ambition and precision. 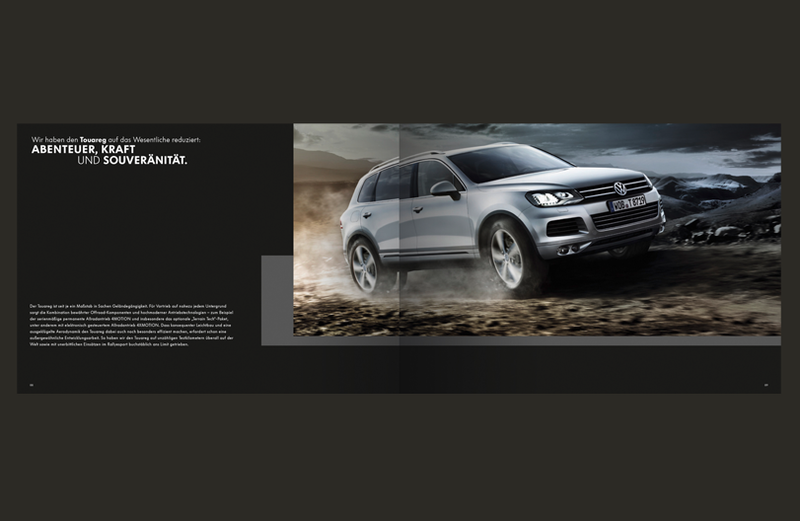 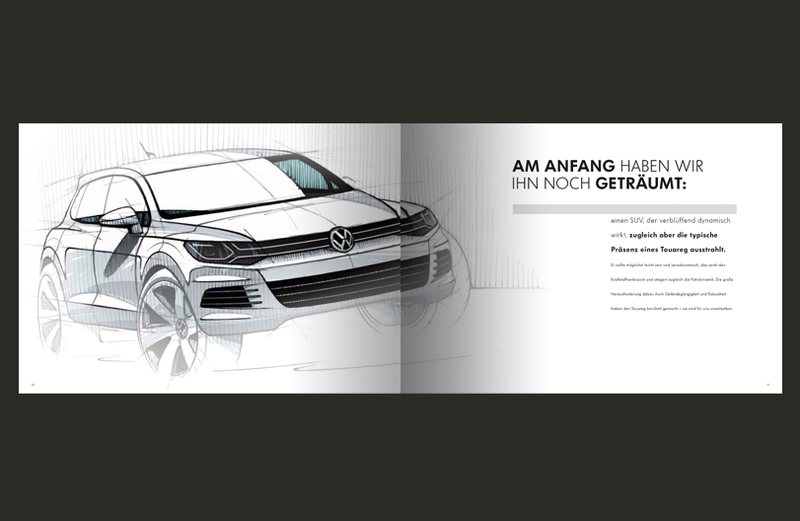 This book was designed based on the insight that the new Touareg is crossing boundaries. 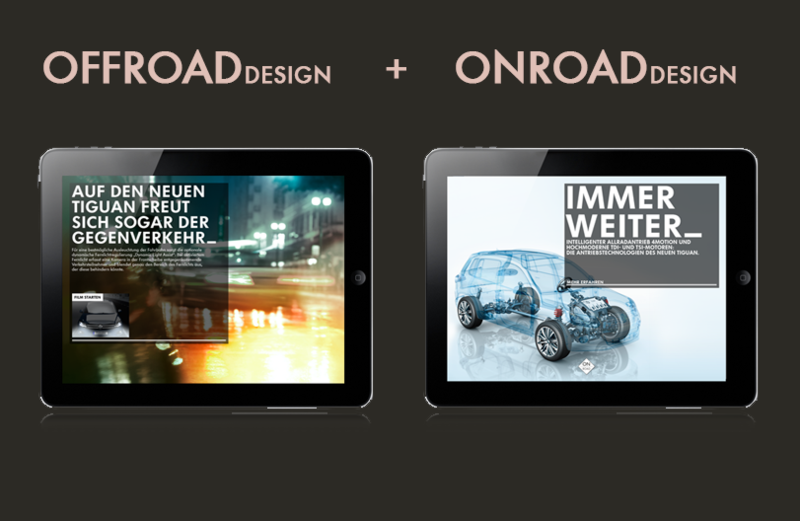 He connects different worlds together – first we dreamed how it could be and then we built it. 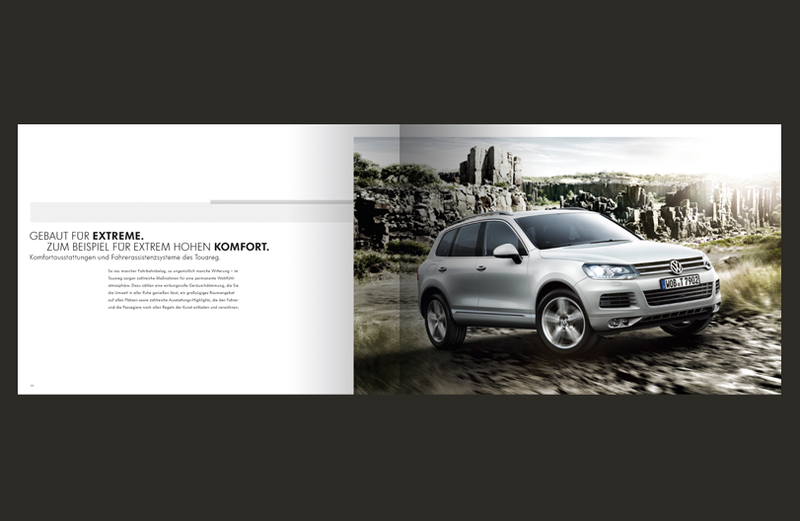 The design shows the strength of its beauty, its power and authority – it’s more than a catalogue – even more than a car. 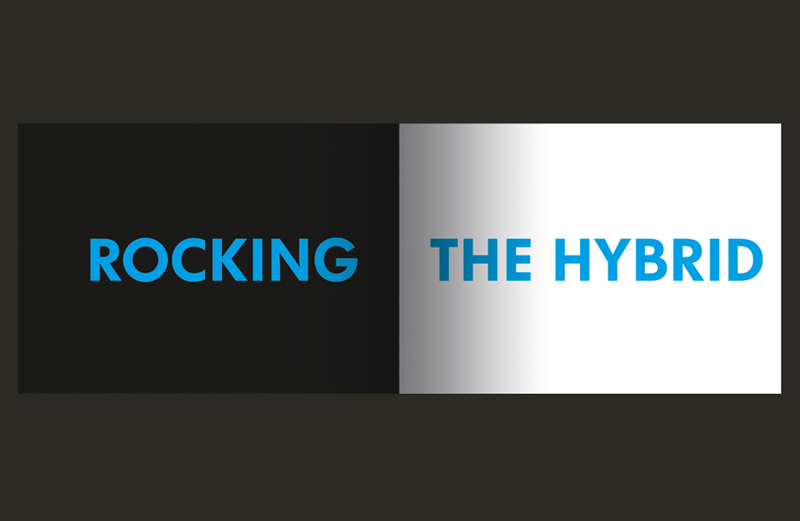 The 1st ‘flavor-your-way’ cooking/baking video series in the food industry. 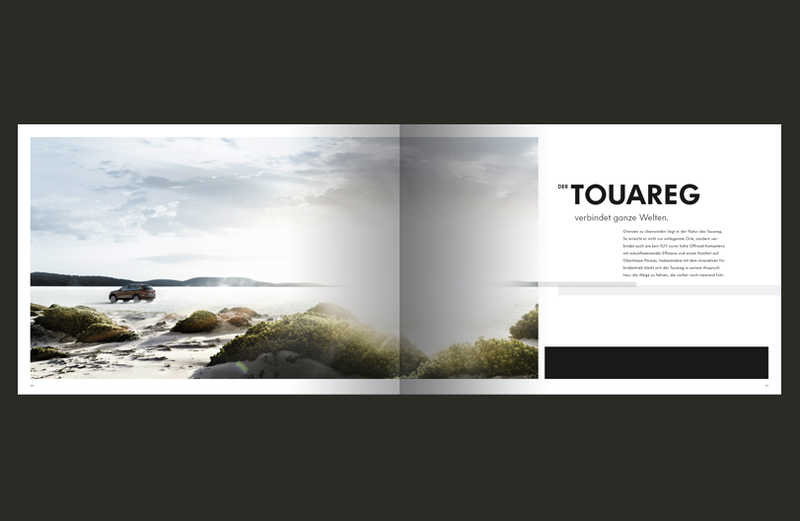 McCormick presents this interactive, choose-your-own-adventure video to help you navigate through flavor choices and with this, let you create your own ‘how-to’ video recipe. 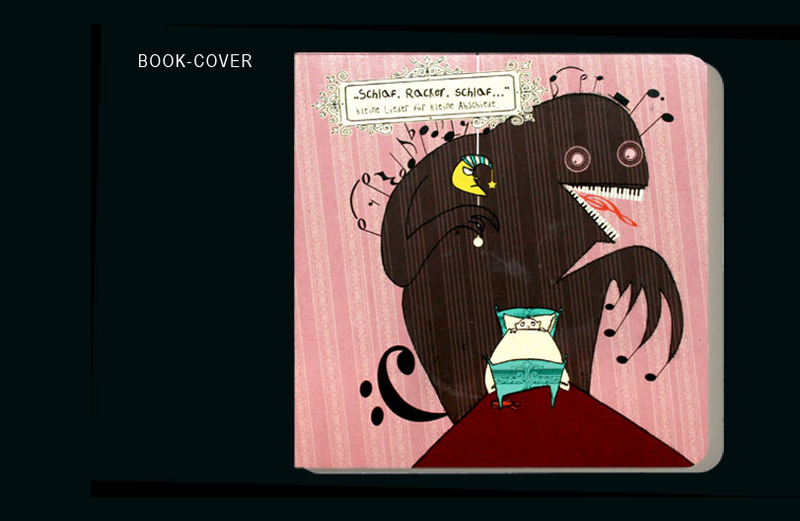 Ina taught POPCULTURE ENGINEERING at Miami Ad School New York – there she worked together with a team that came up with this outstanding piece of student work. 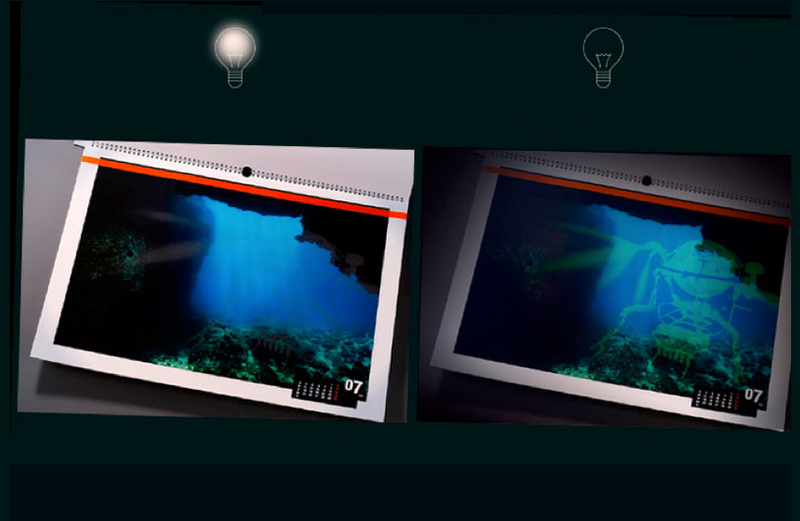 It’s aimed at bringing Augmented Reality story telling to every LEGO set around the world. 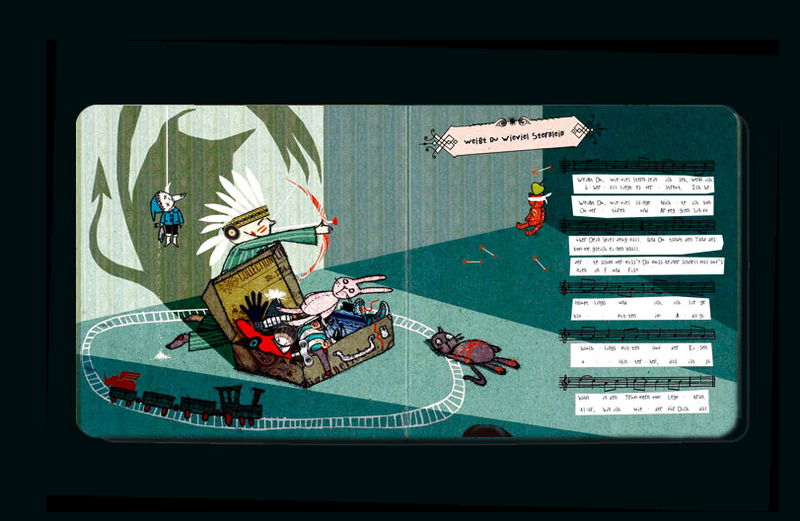 Grab a box, build the object brick by brick and then hold up an iPhone or iPad to bring it to life, creative an interactive story that constantly evolves as you continue to build and change that model. 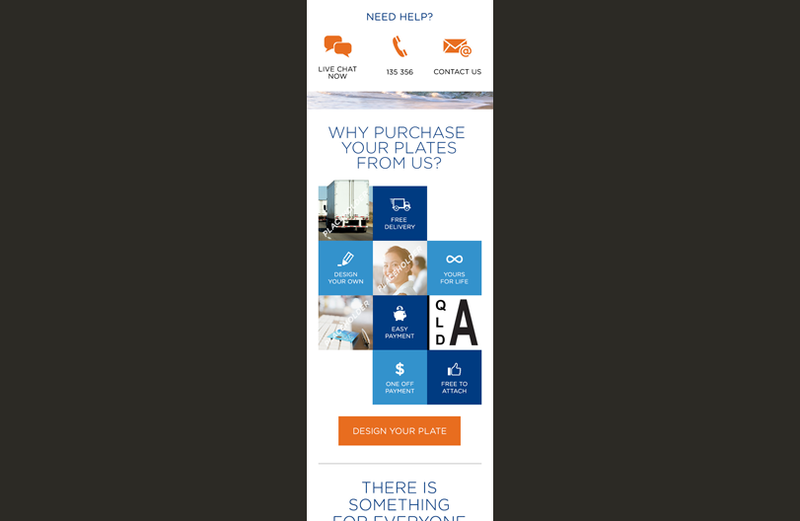 Are you a creative expert (designer, front/back-end developer, mobile-expert, UX-strategist, copywriter, etc.) 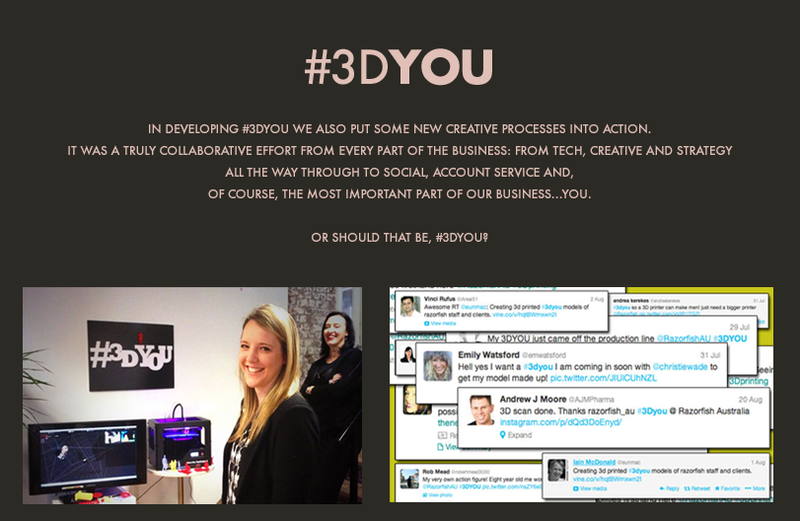 from anywhere in the world and interested in future collaborations to re-invent marketing or just to do something AWESOME?